本发明涉及虚像显示装置。 The present invention relates to a virtual image display apparatus. 提供具有使外界光和图像光重叠地显示的透视功能、广视角·高性能且小型轻量的虚像显示装置。 Provided that the ambient light having a superimposed image light displayed through function, and wide viewing angle High performance compact, lightweight virtual image display apparatus. 因为通过投影透镜（30）等在棱镜（10）的内部形成中间像，并按第3面（S13）、第1面（S11）及第2面（S12）的顺序在2个面以上全反射的图像光（GL）透射第1面（S11）而到达观看者的眼睛（EY），所以能够使棱镜（10）薄型而使光学系统整体小型而轻量，并实现广视角而明亮的高性能的显示。 Because the sequence by the projection lens (30) or the like is formed inside the prism at the intermediate image (10) and press the third surface (S13), the first surface (S11) and a second surface (S12) at least two total reflection surfaces the image light (GL) passes through the first surface (S11) reaches the viewer's eye (EY), it is possible to make the prism (10) so that a thin and lightweight overall size of the optical system, and wide viewing angle and a bright, high-performance display. 并且，关于外界光（HL），能够通过例如第1面（S11）和第3面（S13）而观看，因为使此时的视度基本为0，所以能够降低当透视地观看外界光（HL）时的外界光（HL）的散焦和／或失真。 And, with respect to the external light (HL), for example, can be viewed through the first surface (S11) and the third surface (S13), so that at this time because substantially zero diopter, can be reduced when perspectively viewing the external light (HL ) external light (HL) when defocus and / or distortion. 并且，棱镜（10）的形状能够为按照观看者的面部的形状，重心也接近面部，设计也优异。 Further, the shape of the prism (10) is able to follow the shape of the face of the viewer, the center of gravity close to the face, excellent design. 本发明涉及将通过图像显示元件等形成的图像提供给观看者的虚像显示装置，尤其涉及适于在观看者的头部配戴的头戴式显示器的虚像显示装置。  The present invention relates to a viewer will be provided by the image forming element or the like of an image display virtual image display device, particularly to a head-mounted display worn on the head of the viewer is adapted to a virtual image display apparatus. 作为组入于在观看者的头部配戴的头戴式显示器（以下，也称为HMD)等的虚像显示装置的光学系统提出各种方案(参照专利文献1〜4)。  The optical system of a display apparatus of various solutions proposed (refer to Patent Document 1 ~ 4) as set into the head mounted display to a viewer wearing (hereinafter, also referred to as HMD) or the like of the virtual image. 关于HMD等的虚像显示装置，期待使图像光广视场角化和降低装置重量。  HMD or the like on the virtual image display device, the optical image to look wide angle of field and reduced weight of the device. 尤其是， 为了使配戴感舒适，重要的是使观看者的视轴方向的厚度变薄，并使重心接近观看者。 In particular, in order to make wearing comfort, it is important that the viewer depending on the thickness of the thin axial direction, and the center of gravity closer to the viewer. 并且，若完全覆盖观看者的视场，成为仅能看到图像光的状态，则观看者判断不了外界的状态，会产生不安。  and, if completely covers the field of view of a viewer, to become a state see only the image light, the viewer can not determine the state of the outside world, it will produce anxiety. 而且，通过使外界和图像重叠观看，可产生如虚拟现实的各种新的用途。 Moreover, by making the outside and watch the images overlap, can produce a variety of new applications such as virtual reality. 因此，期待不妨碍外界的视场地重叠显示图像光的显示器。 Thus, without prejudice to the expected field of view outside the display image superimposed light display. 而且，为了使观看者的配戴感舒适、并使外观的形态良好，一般期望接近眼镜的形态，期望不将图像显示装置置于眼睛的上方而配置于面部的横向。  Further, in order to make wearing comfort of the viewer, a good appearance and shape, generally close to the desired shape of the glasses, a desired image display apparatus is not disposed above the eye is disposed in the lateral face. 为了使光学系统小型化，并且不会妨碍视场地使图像显示装置离开观看者的眼睛的位置，可以采用使显示图像光暂时在光学系统之中成像而形成中间像，并使该中间像放大地观看的中继光学系统。  In order to make the optical system compact, and does not hinder the visual field image to a position away from the viewer's eyes device display, the display image light may be used temporarily in the imaging optical system forms an intermediate image, and the intermediate enlarged image relay optical system viewed. 例如在专利文献1中，提出采用端面为抛物面镜的平行平面状的导光板和投影透镜，在导光板的内部形成中间像的中继光学系统。  For example, Patent Document 1 proposes use of planar end surface of the light guide plate and the projection lens parallel parabolic mirror, a relay optical system forming an intermediate image in the interior of the light guide plate. 可是，在专利文献1的光学系统的情况下， 投影透镜大，妨碍小型轻量化。 However, in the case where the optical system in Patent Document 1, the projection lens larger in size and weight interfere. 在专利文献2中，提出采用具备曲面的射出反射面的导光棱镜和投影透镜的中继光学系统。  In Patent Document 2, it has proposed use of a reflecting surface emitting light guide prism and the projection lens surfaces of the relay optical system. 可是，专利文献2的光学系统未兼顾到使观看者看到外界。 However, in Patent Document 2, the optical system does not take into account the viewer to see the outside world. 为了应用该光学系统而使外界可见，需要在扩展到棱镜整体的反射面贴附补偿棱镜并在接合面设置半透射半反射镜，因为图像光在该半透射半反射镜面反射2次，所以变得非常暗。 In order to apply the outside visibility of the optical system, it is necessary to expand the entire patch compensating prism reflecting surface of the prism and bonding the semi-reflective mirror is provided, because the image light reflected specularly reflective transflective 2 times the half, it becomes very dark. 在专利文献3中，提出包括投影透镜、凹面镜和导光板的中继光学系统。  In Patent Document 3 proposes a relay optical system including a projection lens, a concave mirror and the light guide plate. 该光学系统中，通过使波长板和偏振半透射半反射镜组合，提高反射效率。 The optical system by the wavelength plate and a polarizing semitransparent mirror combination, improve the reflection efficiency. 可是，为了应用专利文献3 的光学系统而使外界可见，需要在凹面镜贴合补偿透镜，整体性地变厚。 However, Patent Document order to apply the optical system 3 outside the visible, requires compensation lens bonded in the concave mirror, the integrity thickened. 在专利文献4中，提出通过使光路弯曲，缩短全长、紧凑集中的中继光学系统。  In Patent Document 4, made by bending the optical path, reducing the total length, a relay optical system compact set. 可是，在专利文献4的光学系统的情况下，棱镜中央的凸部和/或投影透镜会妨碍视场。 However, in the case of Patent Document 4, the optical system, a prism central convex portion and / or interfere with the field of view of the projection lens. 并且， 因为图像光在透射了半透射半反射镜之后，折返并以半透射半反射镜反射而入射于眼睛， 所以看到的图像变暗。 Further, since the image light is transmitted through the semitransparent mirror after turning back and to the semi-reflective mirror is incident on the eye, the image seen darkened. 本发明目的在于提供具备使外界光和图像光重叠显示的透视功能、广视角且高性能，并且小型轻量的虚像显示装置。  The object of the present invention to provide a perspective function of ambient light so that includes light displayed superimposed image, wide viewing angle and high-performance, lightweight and compact virtual image display apparatus. 本发明涉及的虚像显示装置使图像光和外界光同时被观看;具备使图像光产生的图像元件和包括3个面以上的非轴对称的曲面并作为光学系统的一部分在内部形成中间像的1个棱镜；当通过构成棱镜的多个面之中的第1面和第3面而观看外界时，视度基本为0;第1面和第3面相对于观看侧呈凹面形状;来自图像元件的图像光在以第3面全反射、以第1面全反射、以第2面反射之后，透射第1面而到达观看侧。  The present invention relates to a virtual image display means causes the image light ambient light while being viewed; includes image elements of the image light generating and including three or more surfaces symmetrical curved non axis as part of an optical system forming an intermediate inside like the prism 1; and when viewed by the outside among the plurality of surfaces constituting the first prism surface and a third surface, substantially zero diopter; a first surface and a second surface 3 has a concave shape to the viewing side; from image element to the third surface light totally reflected at the first total reflection surface to the second surface after the reflection, transmission of the first surface to reach the viewing side. 在此，所谓图像光是指通过图像元件等形成而对于眼睛可以识别为虚像的光，如所述地在棱镜的内部形成中间像。 Here, the image formed by the image light refers to elements like the eye may be identified as a virtual image of the light, as said intermediate image is formed inside the prism. 在所述虚像显示装置中，因为通过光学系统等在棱镜的内部形成中间像，并且按第3面、第1面及第2面的顺序反射的图像光透射第1面而到达观看者，所以能够使棱镜薄型而使光学系统整体小型且轻量，并实现广视角而明亮的高性能的显示。  In the virtual image display device, since the optical system is formed by the intermediate image within the prism, and by the third surface, a first order image surface and a second surface of the reflective surface of the light transmission reaches a first viewing who, it is possible to thin the whole prism compact and lightweight optical system, and bright wide viewing angle and high-performance display. 并且，关于外界光， 能够通过第1面和第3面而观看，因为使此时的视度基本为0,所以能够降低当透视地观看外界光时的外界光的散焦和/或失真。 And, with respect to external light can be viewed through the first surface and the third surface, at this time so as substantially zero diopter, can be reduced when viewed in perspective defocus external light when the external light and / or distortion. 并且，棱镜的形状为按照观看者的面部的形状，重心也能够接近面部，在设计性方面也能够优异。 Further, the shape of the prism is in the shape of the face of the viewer, the center of gravity can be close to the surface, in terms of design can be superior. 还有，在以上中，各面的包括正交坐标x及y的本地坐标(x，y，z)以曲面上的某1点为原点，取z轴为面的法线方向，取x轴和y轴为面的切线方向。  In addition, in the above, the local coordinates of each surface comprises an orthogonal coordinate of x and y (x, y, z) at one point on a curved surface as the origin, a normal direction taken as the z-axis plane, taken as the x and y axes of the plane tangential direction. 曲面的原点例如为光束中心通过的位置。 For example, the origin of the surface position through the center of the beam. 在本申请发明中，通过使不仅关系到图像光而且关系到外界光的观看的第1面和第3面为自由曲面，并使两个面在观看者侧成为凹面状，有效地使用它们的曲面形状的自由度，并成功地得到高像质的光学系统。  In the present invention, by making not only to the relationship between the image light and external light is viewed and the first surface of the third surface is a free-form surface, and becomes two concave faces the viewer side, effectively they use curved shape freedom, and succeeded in obtaining a high image quality of the optical system. 因为使第1面及第3面的作用即曲面的作用成为特征的是曲面的曲率，原点附近的曲率主要通过系数Ak2, 〇和Ako, 2 (k = 1，3)的值确定，所以重要的是适当地设定系数Ak2, 〇和Ako, 2的值。 Because the effect that the second surface of the first surface 3 i.e., the acting surface is a curved surface characterizes a curvature, the curvature near the origin by a factor of major Ak2, square and Ako, the value of 2 (k = 1,3) is determined, it is important is appropriately set coefficient Ak2, square and Ako, a value of 2. 条件⑴对原点附近的第1面的曲率和第3面的曲率的大小进行限定。  Conditions ⑴ size of curvature of the first surface and the third surface curvature in the vicinity of the origin to be limiting. 它们的值八12,()^1(),2)32,()^3(),2为负表示第1面或第3面相对于观看者为凹面状。 8:12 their values, () ^ 1 (), 2) 32, () ^ 3 (), 2 denotes a negative first surface or the third surface is concave to the viewer. 若超过条件（1)的上限，则形状接近为平面，即使对外界光的观看不存在问题也不会在图像光的像差校正方面有效地起作用。 Exceeds the condition (1) is exceeded, the shape close to a plane, does not function effectively in terms of aberration correction even when the image light of external light is viewed there is no problem. 并且，若超过条件（1)的下限，则曲率变得过强，像差校正难以进行，并且棱镜的位置接近面部，有损配戴感。 And, if it exceeds the condition (1) the lower limit, the curvature becomes too strong, it is difficult to perform aberration correction, and a position close to the prism face, detrimental wear feeling. 条件⑵对第3面的x轴方向的曲率和y轴方向的曲率之差进行限定。  ⑵ difference condition on x-axis direction of the third surface curvature and the curvature of the y-axis direction are defined. 若超过条件(2)的上限，则在第3面产生的像散变得过大，难以进行像差校正。 Exceeds the condition (2) is exceeded, then the image plane of the third dispersion generated becomes too large, it is difficult to correct aberrations. —般地，因为若远方视度的误差超过±1D则会感到不愉快，所以优选:棱镜的视度抑制为±1D。  - camel, because if the distance dioptric power error exceeds ± 1D will feel unpleasant, it is preferable that: the prism diopter suppressed to ± 1D. 但是，根据与外周部的视度和/或像差之间的平衡，也存在设计上将光轴上的视度设定为±2D的范围的情况。 However, according to the balance between the visual and / or the outer circumferential portion of the aberration, but also there is a case on the visual design of the optical axis is set in a range of ± 2D. 虽然光轴上的视度如所述的式地，因为与棱镜的厚度和/或折射率也有关系，所以仅以非球面系数的值确定不了，但是只要系数处于满足条件(3)的范围，则可以将光轴上的视度抑制为±2D的范围。 Although depending on the optical axis of the said formula, as the thickness and / or refractive index of the prism also has a relationship, so that only the values ​​of aspherical surface coefficients not determined, but as long as the coefficient in the range satisfying the condition (3), the diopter on the optical axis can be suppressed within a range of ± 2D. 通过使第1面及第3面成为满足以上的条件⑴〜⑶的形状，能够良好地进行外界光和图像光的双方的像差校正，带来优异的像质。 , aberration correction can be satisfactorily performed both ambient light and image light by the first surface and a second surface 3 becomes more ⑴~⑶ shape satisfies the condition, bring about excellent image quality. 在本发明的另一侧面中，棱镜具有光射出侧的第1棱镜部分和光入射侧的第2棱镜部分，所述光射出侧的第1棱镜部分具有第1面、第2面和第3面;并且第1棱镜部分和第2棱镜部分一体形成。  In another aspect of the present invention, the prism having a second prism portion and a first prism portion of the light incident side of the light emission side, the light exit side of the first prism portion having a first surface, a second surface, and third surface; and a first portion and a second prism prism portion integrally formed. 在本发明的又一侧面中，在第2面形成半透射半反射镜，将图像光提供给观看者， 并在第2面的外侧一体地配置光透射构件，使相对于外界光的视度基本为0,将外界光和图像光重叠地提供给观看者。  In a further aspect of the present invention, the semi-reflective mirror is formed on the second surface, the image light provided to the viewer, and the light transmitting member is integrally disposed on the outside surface of the second, the phase for the external light substantially zero diopter, the outside light and the superimposed image light provided to the viewer. 该情况下，能够降低透过第2面观看的外界光的散焦和/或失真。 In this case, outside light can be reduced defocus and / or distorted as viewed through the second surface. 在本发明的又一侧面中，光透射构件在观看者侧具有第1透射面和第2透射面并在外界侧具有第3透射面，棱镜的第2面和光透射构件的第2透射面具有基本相同的曲面形状， 第2面和第2透射面一体化。  In a further aspect of the present invention, the light transmission member having a first transmitting surface and the second transmitting surface on the viewer side and has a third transmissive surface on the external side of the second prism to the second surface and a light transmission member transmitting surface having substantially the same curved surface, the second surface and the second transmissive surface integration. 该情况下，能够使面彼此接合而一体化，能够在第1面及第3面侧分别形成连续的表面。 In this case, it is possible that the surfaces engage each other and integrated, continuous surface can be formed respectively in the third side surface. 在本发明的又一侧面中，进一步具备使来自图像元件的图像光入射于棱镜的投影透镜;至少棱镜的一部分和投影透镜构成形成中间像的中继光学系统。  In a further aspect of the present invention, there is further provided image light from the image incident on the prism element projection lens; at least a portion of the prism and the projection lens optical system constitute an intermediate image is formed in the relay. 在本发明的又一侧面中，投影透镜包括轴对称的透镜，包括至少1个面以上的非球面。  In a further aspect of the present invention, the projection lens comprises an axisymmetric lens, comprising at least one or more aspherical surfaces. 在本发明的又一侧面中，第2棱镜部分具有至少1个以上的光学面，并通过图像元件、投影透镜和第2棱镜部分形成中间像。  In a further aspect of the present invention, the second prism portion having at least one optical surface, and the projection lens and a second prism portion forming an intermediate image by the image element. 该情况下，第2棱镜部分的光学面作为中继光学系统的一部分参与中间像的形成。 In this case, the optical surface of the second prism portion as part of the relay optical system contributes to the formation of an intermediate image. 在本发明的又一侧面中，图像元件为从显示位置射出图像光的图像显示元件;投影透镜和第2棱镜部分作为中继光学系统，使从图像显示元件的显示位置射出的图像光在棱镜的内部成像而形成中间像。  In a further aspect of the present invention, the image display element as an image element the image light emitted from the display position; projection lens and a second prism portion as a relay optical system, so that the display position of the image from the image display element is emitted light inside the imaging prism to form an intermediate image. 该情况下，通过投影透镜等作为中继光学系统而起作用，能够使从图像显示元件的显示位置上的各点射出的图像光在棱镜内再成像而形成中间像。 In this case, it acts as a relay optical system and the like through a projection lens, enabling the display position of each point on the image display element is emitted from the image light in the prism re-imaging the intermediate image is formed. 在本发明的又一侧面中，第2棱镜部分具有兼具作为折射面及反射面的功能的至少1个以上的光学面。  In a further aspect of the present invention, the second prism portion having both at least one optical surface as a function of the refractive surface and reflective surface. 在本发明的又一侧面中，第1面与第3面的间隔为5mm以上且15mm以下。  In a further aspect of the present invention, the distance between the first surface and the third surface is 5mm or more and 15mm or less. 该情况下， 通过为5_以上，能够使覆盖眼前的第1棱镜的大小充分地大;通过为15_以下，能够对重量增加进行抑制。 In this case, by providing the above 5_, the size can be made to cover the front of the first prism is sufficiently large;, weight increase can be suppressed by providing 15_ or less. 在本发明的又一侧面中，第2面相对于第1面的倾斜角为20°以上且40°以下。  In a further aspect of the present invention, the second surface to the first surface inclination angle of 20 ° or more and 40 ° or less. 该情况下，通过倾斜角处于所述范围，容易将图像光以适当的反射次数及反射角度导入眼睛。 In this case, the inclination angle is in the range, easy to image light reflected at appropriate times and reflection angle into the eye. 在本发明的又一侧面中，包括棱镜的光学系统在配戴时覆盖观看者的眼前之中的一部分，使眼前未被覆盖的部分存在。  In a further aspect of the present invention, the optical system comprises a prism in front of a portion covering the viewer when wearing the uncovered front part presence. 在本发明的又一侧面中，图像元件具有射出对应于图像调制的信号光的信号光形成部和通过使从信号光形成部入射的信号光扫描而作为扫描光射出的扫描光学系统。  In a further aspect of the present invention, the image corresponding to the image element that emits signal light modulated signal forming section and the light scanning optical system scanning the signal light from the signal light incident portion is formed as a scanning light emitted . 图1是对实施方式的虚像显示装置的外观进行说明的立体图。  FIG. 1 is an external apparatus of the embodiment of a virtual image display perspective. FIG. 图2是对虚像显示装置的主体结构进行说明的立体图。  FIG. 2 is a main structure of the virtual image display device is a perspective view illustrating the. 图3(A)是构成虚像显示装置的第1显示装置的主体部分的俯视的剖视图，（B)是主体部分的主视图。  FIG. 3 (A) is a top sectional view of the configuration of the body portion of the apparatus of the first display virtual image display device, (B) is a front view of the body portion. 图4是对第1显示装置中的棱镜中的光学面和/或光路进行说明的剖视图。  FIG. 4 is a first display device of the optical surface of the prism and / or a cross-sectional view of the optical path will be described. 图5是对实施例1的光学系统进行说明的图。  FIG. 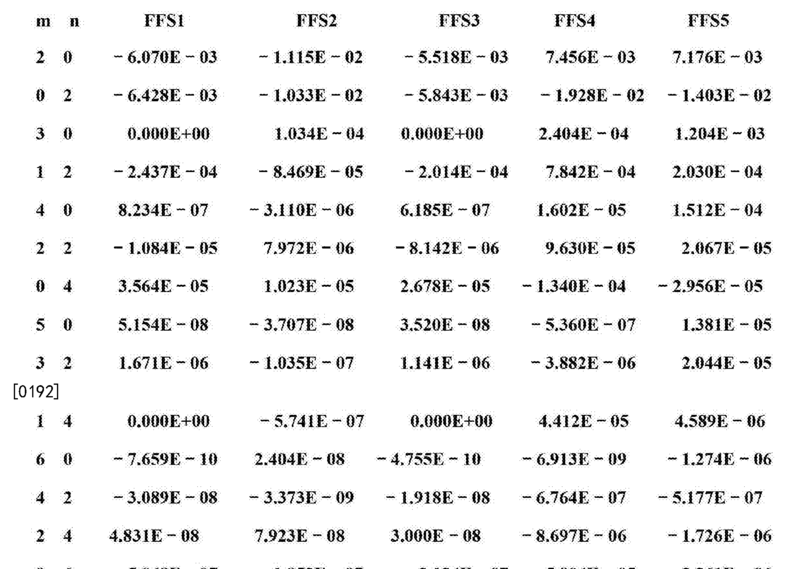 5 is an optical system according to Example 1 will be described in FIG. 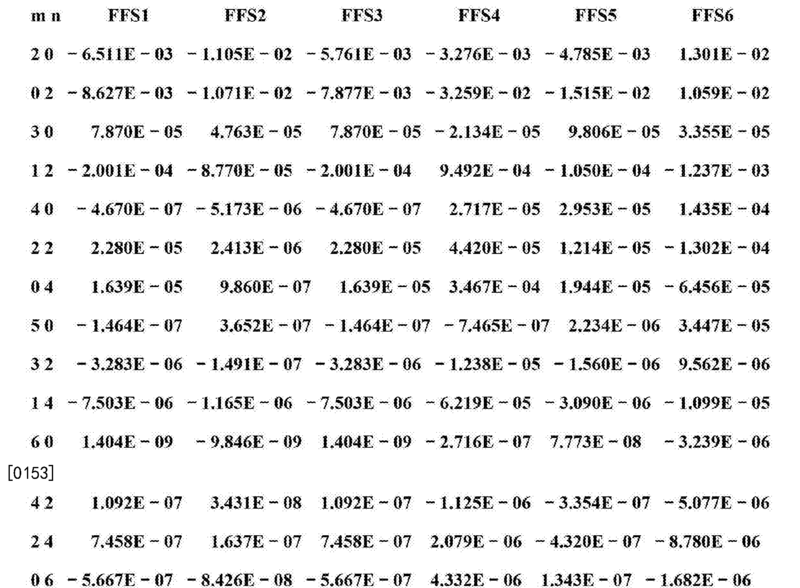 图6 (A)〜(F)是对实施例1的光学系统的像差进行说明的图。  FIG. 6 (A) ~ (F) is an aberration of the optical system according to the embodiment. FIG. 图7 (A)〜(F)是对实施例1的光学系统的像差进行说明的图。  FIG. 7 (A) ~ (F) is an aberration of the optical system according to the embodiment. FIG. 图8是对实施例2的光学系统进行说明的图。  FIG. 8 is an optical system of Example 2 of the embodiment. FIG. 图9 (A)〜(F)是对实施例2的光学系统的像差进行说明的图。  FIG. 9 (A) ~ (F) is aberration of the optical system of the second embodiment described for FIG. 图10 (A)〜(F)是对实施例2的光学系统的像差进行说明的图。  FIG. 10 (A) ~ (F) is aberration of the optical system of the second embodiment described for FIG. 图11是对实施例3的光学系统进行说明的图。  FIG. 11 is an optical system according to Example 3 will be described in FIG. 图12 (A)〜(F)是对实施例3的光学系统的像差进行说明的图。  FIG. 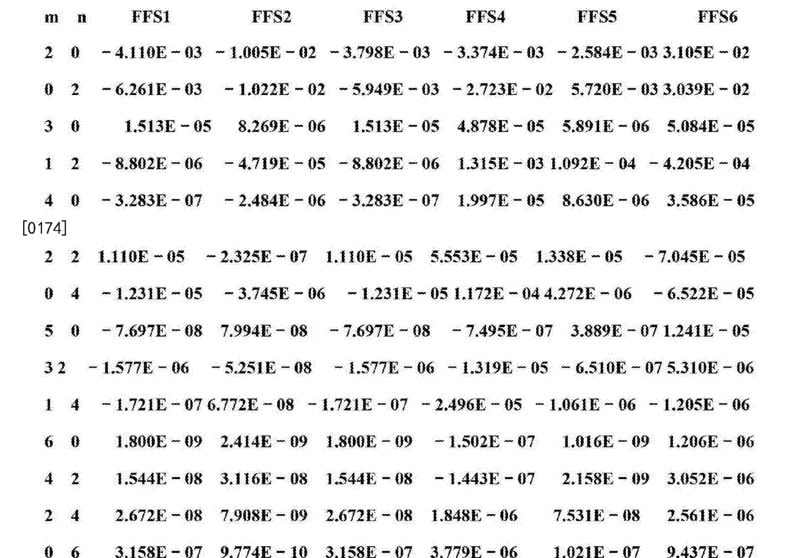 12 (A) ~ (F) is an aberration of the optical system of Example 3 will be described in FIG. 图13 (A)〜(F)是对实施例3的光学系统的像差进行说明的图。  FIG. 13 (A) ~ (F) is an aberration of the optical system of Example 3 of the embodiment. FIG. 图14是对实施例4的光学系统进行说明的图。  FIG. 14 is an optical system of Example 4 of the embodiment. FIG. 图15 (A)〜(F)是对实施例4的光学系统的像差进行说明的图。  FIG. 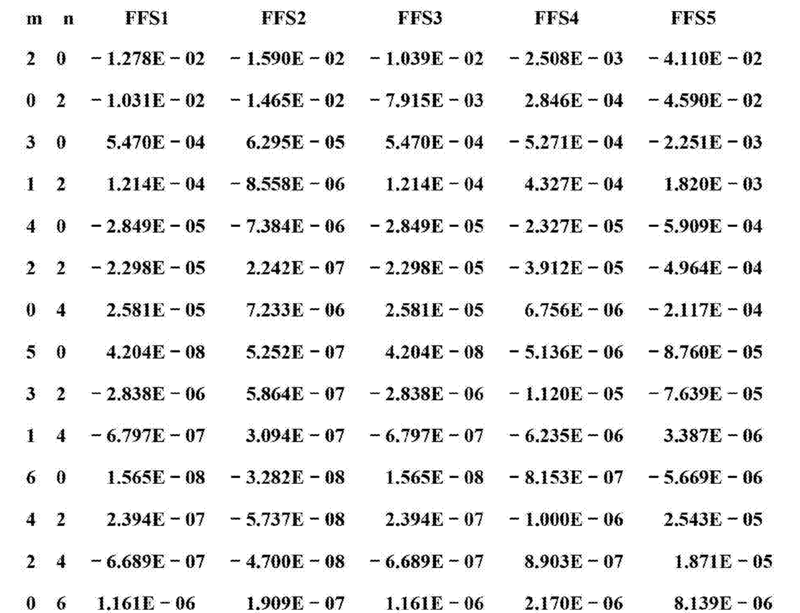 15 (A) ~ (F) is an aberration of the optical system of Example 4 will be described in FIG. 图16 (A)〜(F)是对实施例4的光学系统的像差进行说明的图。  FIG. 16 (A) ~ (F) is an aberration of the optical system of Example 4 will be described in FIG. 图17是对实施例5的光学系统进行说明的图。  FIG 17 is an optical system of Example 5 of the embodiment. FIG. 图18 (A)〜(F)是对实施例5的光学系统的像差进行说明的图。  FIG. 18 (A) ~ (F) is an aberration of the optical system of Example 5 will be described in FIG. 图19 (A)〜(F)是对实施例5的光学系统的像差进行说明的图。  FIG. 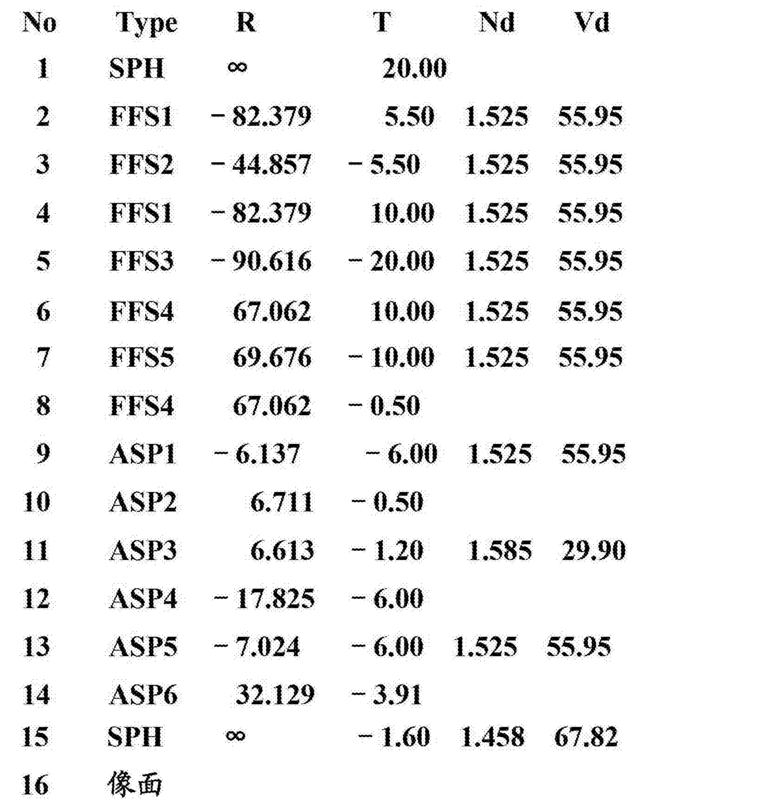 19 (A) ~ (F) is an aberration of the optical system of Example 5 will be described in FIG. 图20是对实施例6的光学系统进行说明的图。  FIG. 20 is an optical system of Example 6 of the embodiment. FIG. 图21 (A)〜(F)是对实施例6的光学系统的像差进行说明的图。  FIG. 21 (A) ~ (F) is an aberration of the optical system of Example 6 will be described in FIG. 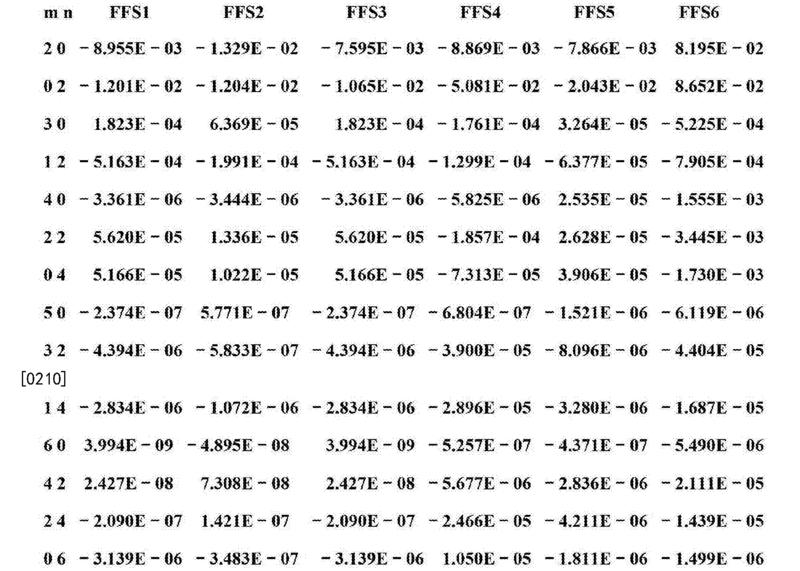 图22 (A)〜(F)是对实施例6的光学系统的像差进行说明的图。  FIG. 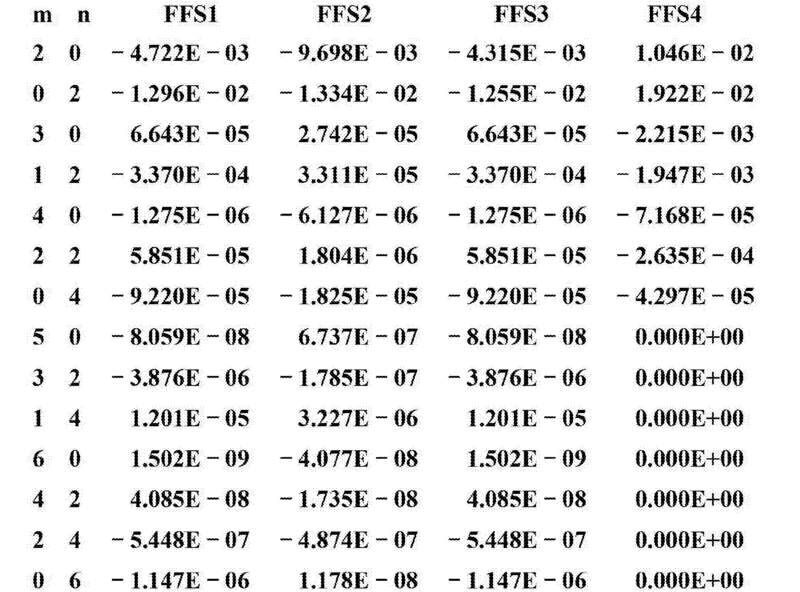 22 (A) ~ (F) is an aberration of the optical system of Example 6 will be described in FIG. 图23是对变形例的虚像显示装置进行说明的图。  FIG. 23 is a modified example of the virtual image display apparatus illustrated in FIG. 图24(A)是关于导光装置及采用其的虚像显示装置的另一例进行说明的立体图， (B)是主视图。  FIG. 24 (A) relates to another embodiment of the apparatus using the light guide means and the virtual image which is a perspective view illustrating a display, (B) is a front view. 以下，一边参照附图，一边关于本发明涉及的一个实施方式的虚像显示装置详细进行说明。  Hereinafter, the virtual image with respect to one embodiment of the invention relates to a display device will be described in detail with reference to the drawings. 示于图1的实施方式的虚像显示装置100为具有如眼镜的外观的头戴式显示器，对于配戴该虚像显示装置100的观看者能够使对应于虚像的图像光被观看，并能够使观看者透视地观看或观察外界像。  the embodiment shown in FIG. 1 of the virtual image display device 100 is a head-mounted display appearance of the eyeglasses, for wearing the virtual image viewer of the display device 100 enables the corresponding virtual image of the image light is viewed, and It enables the viewer to view or a perspective view the outside world image. 虚像显示装置100具备覆盖观看者的眼前的透视构件101、对透视构件101进行支持的框架102和附加于框架102的左右两端的从罩部到后方的悬挂部分(鬓角）的部分的第1及第2内置装置部105a、105b。 The virtual image display device 100 includes a cover front perspective view of member 101 of a viewer, framework through member 101 to support 102 and first attached to the frame 102 from the cover portion to the suspension portion of the rear (the temple) in the portion of the ends of the right and left and The second built-in apparatus unit 105a, 105b. 在此，透视构件101为以覆盖观看者的眼前的厚度而弯曲的光学构件(透射眼罩），分为第1光学部分l〇3a和第2光学部分103b。 Here, the optical member 101 is a perspective view of cover thickness to the viewer in front of the curved member (transmission goggles), optical portion l〇3a divided into a first and a second optical portion 103b. 在附图中使左侧的第1光学部分l〇3a和第1内置装置部105a组合的第1显示装置100A为形成右眼用的虚像的部分，即使单独也可作为虚像显示装置而起作用。 Is the imaginary part of the right eye image forming apparatus in a first display the display apparatus 100A of the first optical portion and the first embedded device l〇3a portion 105a of the left side of the drawings manipulation alone or in combination even act as a virtual image . 并且，在附图中使右侧的第2 光学部分103b和第2内置装置部105b组合的第2显示装置100B为形成左眼用的虚像的部分， 即使单独也可作为虚像显示装置而起作用。 Further, in the second display device 100B of the second optical portion 103b and the second reference portion manipulation device built in the right side portion 105b to form the combination of the virtual image for the left eye, even alone as a virtual image display device to function . 如示于图2、图3 (A)、3 (B)等地，第1显示装置100A具备投影透视装置70和图像显示装置80。  As shown in FIG. 2, FIG. 3 (A), 3 (B) and the like, the first display apparatus 100A includes a perspective projection image display apparatus 70 and the apparatus 80. 其中，投影透视装置70具备作为导光构件的棱镜10、光透射构件50和成像用的投影透镜30。 Wherein the perspective projection unit 70 includes a prism light guide member 10, light transmissive member 50 and the projection lens 30 for imaging. 棱镜10和光透射构件50通过接合而一体化，例如牢固地固定于框架61的下侧，使得棱镜10的顶面l〇e和框架61的底面61e相接。 Prism 10 and the light transmitting member 50 are integrated by bonding, for example, firmly fixed to the lower frame 61, such that the bottom surface and the top surface of the frame 61 l〇e 61e of the prism 10 in contact. 投影透镜30介由对其进行收置的镜筒62而固定于棱镜10的端部。 The projection lens 30 is fixed via its accommodating barrel 62 by the prism 10 at an end portion. 投影透视装置70之中的棱镜10和光透射构件50相当于图1中的第1光学部分103a，并且投影透视装置70的投影透镜30和图像显示装置80相当于图1中的第1内置装置部105a。 Prism 10 and the light transmitting member 70 in the perspective projection unit 50 in FIG. 1 corresponds to a first optical portion 103a, and the projection lens 30 and the perspective projection unit 70 of the image display device 80 corresponds to the first portion in the built-in apparatus 1 of FIG. 105a. 还有，因为示于图1的第2显示装置100B具有与第1显示装置100A同样的结构并仅使左右反转，所以第2显示装置100B的详细的说明进行省略。 Further, since the second display device shown in FIG. 1 100B has the same structure as the first display device 100A reversed and only the left and right, so the second detailed explanation is omitted display apparatus 100B. 投影透视装置70之中，棱镜10为俯视按照面部而弯曲的圆弧状的构件，能够考虑分为靠近鼻子的中央侧的第1棱镜部分11和尚开鼻子的周边侧的第2棱镜部分12。 A perspective projection apparatus  70 into the prism 10 is a top face curved according to an arc-shaped member, can be considered divided into a first side of the prism near the center of the nose portion 11 to open the nose monk peripheral side of the second prism section 12. 第1棱镜部分11配置于光射出侧，作为具有光学功能的侧面，具有第1面S11、第2面S12和第3面S13; 第2棱镜部分12配置于光入射侧，作为具有光学功能的侧面，具有第4面S14、第5面S15和第6 面S16。 The first prism portion 11 is disposed on the light emission side, a side surface having an optical function, having a first surface S11, the second surface S12 and the third surface S13; second prism portion 12 is disposed on the light incident side, as having optical functions side surface, having a fourth surface S14, S15 fifth surface and the sixth surface S16. 其中，第1面S11和第4面S14相邻，第3面S13和第5面S15相邻，并在第1面S11和第3面S13之间配置第2面S12,在第4面S14和第5面S15之间配置第6面S16。 Wherein the first surface S11 and S14 adjacent to the fourth surface, the third surface S13 and S15 adjacent to the fifth surface, the second surface and disposed between the first surface S12 S11 S13 and the third surface, the fourth surface S14 and arranged between the fifth surface S15 sixth surface S16. 并且，棱镜10具有相邻于第1〜第6面S11〜S16并互相对置的第1侧面10e和第2侧面10f。 Further, the prism 10 has a first side face 10e and the second side face 10f adjacent to the first surface S11~S16 1 ~ 6 and opposed to each other. 在棱镜10中，第1面S11为以平行于Z轴的射出侧光轴AX0为中心轴或基准轴的自由曲面，第2面S12为以包括于平行于XZ面的基准面SR且相对于Z轴倾斜的光轴AX1为中心轴或基准轴的自由曲面，第3面S13为以射出侧光轴AX0为中心轴或基准轴的自由曲面。  In the prism 10, a first side surface S11 of the optical axis AX0 to exit parallel to the Z axis is the central axis or free-form surface reference axis, to the second surface S12 is included in the plane parallel to the XZ plane SR and the Z axis is inclined with respect to the optical axis AX1 as a free curved surface of the central axis or reference axis, as to the third surface S13 exit side of the optical axis as a center axis AX0 reference axis or free-form surface. 第4面S14 为以包括于平行于XZ面的基准面SR且相对于Z轴倾斜的一对光轴AX3、AX4的2等分线为中心轴或基准轴的自由曲面，第5面S15为以包括于平行于XZ面的基准面SR且相对于Z轴倾斜的一对光轴AX4、AX5的2等分线为中心轴或基准轴的自由曲面，第6面S16为以包括于平行于XZ 面的基准面SR且相对于Z轴倾斜的光轴AX4为中心轴或基准轴的自由曲面。 In the fourth surface S14 is included in the SR plane parallel to the XZ plane and the Z axis is inclined with respect to an optical axis AX3, 2 bisector AX4 is a free curved surface of the central axis or a reference axis, for the fifth surface S15 to include a free-form surface in the plane parallel to the XZ plane SR and relative to a optical axis AX4 Z axis inclined bisector AX5 as a central axis or a reference axis, the sixth surface S16 is included in the parallel SR XZ plane of the surface and the Z axis is inclined with respect to the optical axis AX4 of the free surface of the central axis or reference axis. 还有，以上的第1 〜第6面SI 1〜S16具有:夹着水平(或横向）地延伸而平行于XZ面且光轴AX1〜AX4等通过的基准面SR，关于铅垂(或纵向）的Y轴方向对称的形状。 Further, the above first to sixth surfaces SI 1~S16 comprising: sandwiching the XZ plane parallel to the horizontal (or transverse) axis and extending through the SR AX1~AX4 like reference plane, about the vertical (or longitudinal ) in the Y-axis direction symmetric shape. 棱镜10以在可见光范围呈现高的光透射性的树脂材料形成，例如通过在模具内注入热塑性树脂•使之固化，而成形。  In the prism 10 in the visible range of the resin material exhibiting high light transmittance is formed, for example by injecting thermoplastic resin into the mold • for solidification and shaping. 棱镜10的主体部分l〇s虽然为一体形成品，但是能够考虑分为第1棱镜部分11和第2棱镜部分12。 L〇s body portion of the prism 10 while integrally formed product, but can be considered divided into a first prism portion 11 and the second prism portion 12. 第1棱镜部分11可以进行图像光GL的导波及射出， 并可以进行外界光HL的透视。 The first prism portion 11 may be spread to guide the image light emitted GL, and can be a perspective view of the external light HL. 第2棱镜部分12可以进行图像光GL的入射及导波。 The second prism portion 12 may be an image of incident light GL and the waveguide. 在第1棱镜部分11中，第1面S11作为使图像光GL射出到第1棱镜部分11外的折射面而起作用，并作为使图像光GL在内面侧全反射的全反射面而起作用。  In the first prism portion 11, the first surface S11 functions as an image light GL emitted to the prism of the first refractive surface of the outer portion 11, and total reflection surface as the image side surface of the light totally reflected by the inner GL act. 第1面S11配置于眼睛EY的正面，相对于观看者呈凹面形状。 S11 first surface disposed in front of the eye EY, relative to the viewer has a concave shape. 还有，第1面S11以防止表面的损伤并防止图像的分辨率下降为目的，也能够对主体部分l〇s以硬涂层进行覆盖。 Further, the first surface S11 to prevent damage to the surface and to prevent decrease in resolution of the image, it is possible for main portion covering l〇s for the purpose of a hard coat layer. 该硬涂层通过在主体部分10s的基底面上通过对包括树脂等的涂敷剂进行浸渍处理和/或喷涂处理进行成膜而形成。 The hard coat layer by a base surface 10s of the main body portion comprises a resin coating agent such as immersion treatment and / or spraying is formed by film formation. 第2面S12具有半透射半反射镜层15。  The second surface S12 having the semi-reflective mirror layer 15. 该半透射半反射镜层15为具有光透射性的反射膜(即半透射半反射膜）。 The semi-reflective layer 15 is a mirror having a light transmissive reflective film (i.e., a semi-transmissive semi-reflective film). 半透射半反射镜层(半透射半反射膜)15并非形成于第2面S12的整体，而是形成于其部分区域PA上。 The semitransparent mirror layer (semi-transmissive semi-reflective film) 15 is not formed on the entire second surface S12, but part thereof is formed on the region PA. 也就是说，半透射半反射镜层15形成于使第2面S12扩展的整体区域QA主要关于铅垂方向收窄的部分区域PA上。 That is, the semi-transmissive half mirror layer 15 is formed on the entire region so that the extended S12 QA on the second major surface of the narrowed portion in the vertical direction area PA. 更详细地，该部分区域PA配置于关于铅垂的Y轴方向的中央侧，关于沿着水平的基准面SR的方向基本配置于整体。 In more detail, the portion disposed in the central area PA on the side of the vertical Y-axis direction, and arranged on substantially horizontal direction along the reference surface SR of the overall. 半透射半反射镜层15在主体部分10s的基底面之中的部分区域PA上，通过使金属反射膜和/或电介质多层膜进行成膜而形成。 The semitransparent mirror layer 15 on the base surface in the partial area PA of the main body portion in the 10s, is formed by a metal reflection film and / or a dielectric multilayer film is formed. 因容易通过透视进行外界光HL的观看的观点，半透射半反射镜层15 的对于图像光GL的反射率在假想的图像光GL的入射角范围内为10%以上且50%以下。 Performed by the external light HL views easily viewed by fluoroscopy, the semi-reflective layer for the mirror reflectance image light GL in the range of incident angles of the virtual image light GL is at least 10% and 50% of 15. 具体的实施例的半透射半反射镜层15的对于图像光GL的反射率例如设定为20%，对于图像光GL 的透射率例如设定为80 %。 For reflectance image light GL specific embodiments of the semitransparent mirror layer 15 is set, for example 20%, the transmittance of the image light GL is set, for example 80%. 第3面S13作为使图像光GL在内面侧全反射的全反射面而起作用。  The third surface S13 as image to the inner surface side is totally reflected light GL acts total reflection surface. 还有，第3面S13 以防止表面损伤并防止图像的分辨率下降为目的，也能够对主体部分l〇s以硬涂层进行覆盖。 Further, the third surface S13 in order to prevent surface damage and to prevent the image resolution reduction, it is possible for main portion covering l〇s for the purpose of a hard coat layer. 第3面S13配置于眼睛EY的正面，与第1面S11同样地相对于观看者呈凹面形状，当通过第1面S11和第3面S13看到外界光HL时，视度基本为0。 Third surface disposed in front of the eye EY S13, and S11 and the first surface relative to the viewer the same manner as a concave shape, when passing through the first surface and the third surface S13 S11 to see the external light HL, substantially zero diopter. 在第2棱镜部分12中，第4面S14及第5面S15作为使图像光GL在内面侧全反射的全反射面而起作用或者以镜层17覆盖作为反射面而起作用。  In the second prism portion 12, the fourth surface and the fifth surface S15 S14 as a total reflection surface on image light GL inner surface side is totally reflected on the mirror or in the cover layer 17 to function as a reflective surface. 还有，在使第4面S14及第5面S15 作为全反射面而起作用的情况下，以防止表面损伤并防止图像的分辨率下降为目的，也能够对主体部分1 〇s以硬涂层进行覆盖。 Also, in the first side surface 5 and second 4 S14 S15 functions as a total reflection surface of the case to prevent surface damage and to prevent the image resolution reduction for the purpose of the body portion 1 can be a hard coat 〇s covering layer. 第6面S16作为使图像光GL入射于第2棱镜部分12内的折射面而起作用。  S16 as a sixth surface portion 12 of the inner refractive surface on image light incident on the second prism GL acts. 还有，第6 面S16虽然以防止表面损伤并防止图像的分辨率下降为目的，也能够对主体部分10s以硬涂层进行覆盖，但是以进一步通过防止反射对重影进行抑制为目的，也能够对主体部分l〇s以多层膜进行覆盖。 Further, although the sixth surface S16 in order to prevent surface damage and to prevent the image resolution reduction, it is possible for main portion covering 10s for the purpose of a hard coat layer, but in order to further suppress ghosting by preventing reflection of purposes, l〇s capable of covering the body portion to a multilayer film. 光透射构件50与棱镜10—体地固定。  The light transmitting member 50 is fixed to the prism body 10-. 光透射构件50为辅助棱镜10的透视功能的构件(辅助棱镜），作为具有光学功能的侧面，具有第1透射面S51、第2透射面S52和第3透射面S53。 Light transmitting member 50 is a perspective function of the auxiliary prism member 10 (auxiliary prism), a side surface having an optical function, having a first transmission surface S51, the second transmission surface and the third transmissive surface S52 S53. 在此，在第1透射面S51和第3透射面S53之间配置第2透射面S52。 Here, between the first transmission surface S51 and S53 of the third transmissive surface arranged second transmissive surface S52. 第1透射面S51处于使棱镜10的第1面S11延长了的曲面上;第2透射面S52为相对于该第2面S12通过粘接剂CC接合而一体化的曲面;第3透射面S53处于使棱镜10的第3面S13延长了的曲面上。 S51 is a first transmitting surface on the first surface of the prism S11 10 of the extended surface; the second transmissive surface S52 with respect to the second surface S12 bonded by an adhesive and integrated CC curved surface; third transmissive surface S53 in that the third surface S13 of the prism 10 on the extended surface. 其中的第2透射面S52和棱镜10的第2面S42因为通过接合而一体化，所以具有基本相同的曲率的形状。 Wherein the second transmissive surface S52 and the second prism surface S42 10 because integrated by engagement, so that substantially the same shape having a curvature. 光透射构件(辅助棱镜）50,以在可见光范围呈现高的光透射性、并具有与棱镜10 的主体部分l〇s基本相同的折射率的树脂材料形成。  The resin material of the light transmissive member (auxiliary prism) 50, to present a high light transmittance in the visible range and having a body portion l〇s prism 10 is substantially the same refractive index is formed. 光透射构件50例如通过热塑性树脂的成形而形成。 For example, the light-transmitting member 50 is formed by molding a thermoplastic resin. 投影透镜30保持于镜筒62内，图像显示装置80固定于镜筒62的一端。  The projection lens 30 held in the lens barrel 62, the image display device 80 fixed to one end of the barrel 62. 棱镜10的第2 棱镜部分12连接于对投影透镜30进行保持的镜筒62,间接地支持投影透镜30及图像显示装置80。 The second prism 10 is a prism portion 12 is connected to the barrel 62 pairs of holding the projection lens 30, and indirectly supports the projection lens 30 and the image display device 80. 棱镜10的光入射侧与投影透镜30等一起被遮光构件63覆盖。 The light shielding member 63 is covered with the light-incident side of the prism 30 and the projection lens 10 and the like. 棱镜10上端部或下端部也被遮光构件63覆盖。 An upper end portion or lower end portion 10 of the prism 63 is also covered with the light shielding member. 在棱镜10的周边，能够设置防止外光入射于棱镜10的追加的遮光部。 In the periphery of the prism 10, the light shielding portion can be provided to prevent the external light incident on the prism 10 is added. 遮光部例如能够以遮光性的涂层和/或光散射层构成。 For example, the light shielding unit can be configured in a light-shielding coating layer and / or light-scattering layer. 投影透镜30沿着入射侧光轴AXI例如具有3个透镜31、32、33。  The projection lens 30 along an optical axis of the incident side AXI e.g. having three lenses 31, 32. 各透镜31、32、33为轴对称的透镜，至少1个以上具有非球面。 Each lens 32, 33 axisymmetric lens, having at least one aspheric surface or more. 投影透镜30使从图像显示装置80射出的图像光GL用于再成像而介由棱镜10的第6面S16入射于棱镜10内。 The projection lens 30 from the inner 10 of the image display apparatus 80 emits the image light GL for re-imaging via the sixth surface S16 of the prism 10 is incident on the prism. 也就是说，投影透镜30为用于使从图像显示元件82的像面(显示位置)01上的各点射出的影像光或图像光在棱镜10内再成像的中继光学系统。 That is, as for the projection lens 30 from the image plane of the image display device 82 (display position) of each point on the image light 01 emitted from the relay optical system or the image within the prism 10 and then imaged. 还有，棱镜10的各面通过与投影透镜30协同作用作为中继光学系统的一部分而起作用。 Further, each surface of the prism 10 acts synergistically with the projection lens 30 as part of the relay optical system. 图像显示装置80具有射出2维的照明光SL的照明装置81、作为透射型的空间光调制装置的图像显示元件82和对照明装置81及图像显示元件82的工作进行控制的驱动控制部84。  The image display device 80 has an illumination device 81 emits two-dimensional illumination light SL, a transmission type spatial light modulator of an image display apparatus driving control element and the work 82 illumination device 81 and the image display element 82 for controlling the 84. 图像显示装置80的照明装置81具有产生包括红、绿、蓝的3色的光的光源81a、和使来自光源81a的光扩散而成为矩形截面的光束的背光导光部81b。  The lighting device 81 of the image display device 80 having generating red, green, and blue light source 81a of three colors, and the light from the light source 81a is diffused to become the backlight light guide portion 81b of the beam of rectangular cross-section. 图像显示元件82例如为以液晶显示器件形成的图像元件，对来自照明装置81的照明光SL空间性地进行调制而形成应当成为动态图像等的显示对象的图像光。 The image display element 82, for example, a liquid crystal display element as an image forming device, the illumination light SL spatially from the illumination device 81 modulates light to form an image should be displayed like a moving image object. 驱动控制部84具备光源驱动电路84a和液晶驱动电路84b。 The drive control unit 84 includes a light source driving circuit 84a and the liquid crystal driving circuit 84b. 光源驱动电路84a对照明装置81的光源81a供给电功率而使稳定的辉度的照明光SL射出。 Illumination light source driving circuit 84a 81a luminance supplying the electric power to the illuminating device 81 stable source light SL is emitted. 液晶驱动电路84b通过对于图像显示元件（图像元件)82输出图像信号或驱动信号， 作为透射率图形而形成成为动态图像和/或静态图像的基础的彩色的图像光。 Liquid crystal drive circuit 84b through the image display 82 outputs an image signal or drive signal element (image element), the transmittance of the pattern as a color image formed by light to become the basis of a moving picture and / or still images. 还有，虽然能够使液晶驱动电路84b具有图像处理功能，但是也能够使外附的控制电路具有图像处理功能。 Further, although the liquid crystal driving circuit 84b can be made having an image processing function, but can also be attached to the outer control circuit having an image processing function. C.图像光等的光路  C. the optical path of the image light, etc. 以下，关于虚像显示装置100中的图像光GL等的光路进行说明。  Hereinafter, the virtual image of the image light GL and the like in the optical path of the display apparatus 100 will be described. 从图像显示元件（图像元件)82射出的图像光GL边通过投影透镜30汇聚，边入射于设置于棱镜10的具有比较强的正的折射(能)力的第6面S16。  by the projection lens 30 from the image display element emits light GL (image elements) 82 side, the incident side having a relatively strong positive refractive sixth surface (energy) forces the prism 10 provided in S16. 通过了棱镜10的第6面S16的图像光GL边会聚边行进，当通过第2棱镜部分12时，在具有比较弱的正的折射力的第5面S15反射，在具有比较弱的负的折射力的第4面S14反射。  By the image light GL sixth surface of the prism 10 S16 edges converging edge travels, as by the second prism portion 12, a relatively weak having a relatively weak positive refractive power, a fifth surface S15 reflection, having the negative refractive power of the fourth reflection surface S14. 在第2棱镜部分12的第4面S14反射的图像光GL在第1棱镜部分11中，入射于具有比较弱的正的折射力的第3面S13而全反射，入射于具有比较弱的负的折射力的第1面S11而全反射。  In the second image light GL fourth prism surface S14 of the reflection portion 12 in the first prism portion 11, the incident having a relatively weak positive refractive power, and a third total reflection surface S13, incident with a relatively weak negative refractive power and a first total reflection surface S11. 还有，图像光GL在通过第3面S13的前后，在棱镜10中形成中间像。 Further, before and after the image light GL through the third surface S13 is formed as an intermediate in the prism 10. 该中间像的像面II 虽然对应于图像显示元件82的像面(显示位置)01，但是在第3面S13折返。 The intermediate image corresponding to the image plane II, although the image plane of the image display device 82 (display position) 01, but the folded third surface S13. 在第1面S11全反射的图像光GL虽然入射于第2面S12,但是尤其是入射于半透射半反射镜层15的图像光GL边部分性地透射该半透射半反射镜层15也边部分性地反射而再次入射于第1面S11并通过。  In the transflective mirror layer first surface S11 while totally reflected image light GL incident on the second surface S12, but especially the incident image light GL edge 15 partially transmits in the semitransparent mirror layer 15 may be partially reflective side again incident on the first surface and through S11. 还有，半透射半反射镜层15相对于在此反射的图像光GL具有比较强的正的折射力而起作用。 Further, the semi-reflective layer 15 with respect to the mirror image of the reflected light GL has a relatively strong positive refractive power to function. 并且，第1面S11相对于通过其的图像光GL具有负的折射力而起作用。 Further, the first act with respect to the surface S11 by the image light GL which has a negative refractive power. 通过了第1面S11的图像光GL作为基本平行光束入射于观看者的眼EY的瞳孔。  The image light GL through the first surface S11 as a substantially parallel light beam incident on the pupil of the eye EY of the viewer. 也就是说，观看者通过作为虚像的图像光GL，观看到形成于图像显示元件82上的图像。 That is, by the viewer as a virtual image of the image light GL, viewed on the image formed on the image display element 82. 另一方面，外界光HL之中，入射于比棱镜10的第2面S12靠+ X侧的光虽然通过第1 棱镜部分11的第3面S13和第1面S11，但是此时，正负的折射力抵消并校正像差。  On the other hand, among the outside light HL, compared to the second incident surface S12 of the prism 10 on the + X side of light through the prism while the first and third surface S13 and surface S11 of the first portion 11, but this time , and negative refractive powers cancel aberration is corrected. 也就是说， 观看者隔着棱镜10看到失真少的外界像。 In other words, the viewer through the prism 10 to see the outside world like a little distortion. 同样地，外界光HL之中，入射于比棱镜10的第2面S12靠一X侧也就是说入射于光透射构件50的光当通过设置于此的第3透射面S53和第1透射面S51时，正负的折射力抵消并校正像差。 Similarly, among the outside light HL, incident on the prism 10 than the second surface S12 of X on a side of the light that is incident on the light-transmitting member 50 is provided when the third transmission surface through S53 and the first transmitting surface thereto S51, the negative refractive power cancel and correct aberrations. 也就是说，观看者隔着光透射构件50看到失真少的外界像。 In other words, the viewer through the light transmitting member 50 to see the outside world like a little distortion. 而且，外界光HL之中，入射到对应于棱镜10的第2面S12的光透射构件50的光当通过第3透射面S53和第1面S11时，正负的折射力抵消并校正像差。 Further, among the outside light HL, corresponding to the light incident on the second surface S12 of the light transmitting member 50 when the prism 10 through S11, the negative refractive power of the third offset transmission surface S53 and the first surface and the aberration correction . 也就是说，观看者隔着光透射构件50看到失真少的外界像。 In other words, the viewer through the light transmitting member 50 to see the outside world like a little distortion. 还有，棱镜10的第2面S12和光透射构件50的第2透射面S52 都具有基本相同的曲面形状，都具有基本相同的折射率，并且两者的间隙以基本相同的折射率的粘接层CC填充。 Further, the second surface S12 and S52 the second transmission surface 50 of the prism light-transmitting member 10 have the substantially same curved shape having substantially the same refractive index, and the gap between the two substantially same refractive index as the adhesive CC filling layer. 也就是说，棱镜10的第2面S12和/或光透射构件50的第2透射面S52相对于外界光HL并不作为折射面起作用。 That is, the second surface S12 and / or the second transmission surface S52 of the light-transmitting member 50 with respect to the external light HL does not function as a refracting surface of the prism 10. 但是，因为入射于半透射半反射镜层15的外界光HL边部分性地透射该半透射半反射镜层15也边部分性地反射，所以来自对应于半透射半反射镜层15的方向的外界光HL在半透射半反射镜层15的透射率弱。  However, since the incident on the semi-reflective mirror layer outside light of HL 15 side partially transmits the semi-transmissive half mirror layer 15 side partially reflected, so that from the corresponding semi-reflective mirror layer 15 HL direction external light transmittance of the weaker semi-reflective mirror layer 15. 另一方面，因为图像光GL从对应于半透射半反射镜层15的方向进行入射，所以观看者在半透射半反射镜层15的方向与形成于图像显示元件82上的图像一起看到外界像。 On the other hand, since the image light GL is incident from a direction corresponding to the semi-transmissive half mirror layer 15 is formed with a viewer in the direction of the semi-transmissive half mirror layer 15 on the image display element 82 with the outside world image seen image. 在棱镜10内传播而入射于第2面S12的图像光GL之中，未在半透射半反射镜层15反射的光虽然入射于光透射构件50内，但是通过设置于光透射构件50的未图示的反射防止部可防止返回到棱镜10。  Among the propagation incident on the second surface of the image light GL S12 in the prism 10, 15 is not in the semi-transmissive light reflected by the half mirror layer 50 while the incident light transmissive member, but by providing the light-transmitting member unillustrated reflection preventing portion 50 returns to the prism 10 can be prevented. 也就是说，可防止通过了第2面S12的图像光GL返回到光路上而成为杂散光。 That is prevented by the surface S12 of the second image light GL is returned to the optical path stray light. 并且，从光透射构件50侧入射而在半透射半反射镜层15反射的外界光HL虽然返回到光透射构件50,但是通过设置于光透射构件50的所述的未图示的反射防止部可防止射出到棱镜10。 And, transmitting light incident from the side member 50 and the ambient light semi-transmissive reflective layer HL half mirror 15 is reflected while the light transmission member 50 to return, but by providing on the light transmitting member 50 (not shown) preventing portion is emitted to the prism 10 can be prevented. 也就是说，可防止在半透射半反射镜层15反射的外界光HL返回到光路上而成为杂散光。 That is, the transflective prevented the half mirror 15 reflecting layer outside light returns to the optical path HL stray light. 图4为对棱镜10中的光轴AX1〜AX4和/或本地坐标进行说明的图。  FIG. 4 is a AX1~AX4 optical axis and / or local coordinates of the prism 10 illustrated in FIG. 在以下的说明中，对光学系统的评价和/或表达的方便加以考虑，从观看者的眼睛EY朝向图像显示装置80 的图像显示元件82关于反向行进方向，对光学面和/或光路进行限定。 In the following description, the evaluation of the optical system to be and convenience / or expression of considerations, toward the image from the viewer's eye EY of a display image apparatus 80 of the display device 82 on a reverse direction of travel of the optical surface and / or optical path limited. 在实际的光学系统中，从图像显示元件82发出的光虽然依次通过投影透镜30和棱镜10而到达眼睛EY，但是在该状态下难以进行光学系统的评价。 In a practical optical system, the optical element 82 and reaches the eye EY emitted while sequentially through the projection lens 30 and prism 10, it is difficult to evaluate the optical system in this state from the image display. 因此，设通过处于眼睛EY的位置的光圈而来自无限远的光源的光进入棱镜10,通过投影透镜30而在图像显示元件82成像，进行评价•设计，在以下详述的光学系统的数据也按该顺序表示。 Thus, from the set position through the aperture in the eye EY infinite light enters the prism 10 of the light source, the image display element 82 is imaged by the projection lens 30, • evaluation design data of the optical system is also described in detail below It indicates that order. 还有，关于接合于棱镜10而作为一体使用的光透射构件50,使棱镜10的形状进行了延长，将说明进行省略。 Further, with respect to joining the prism 10 as the light-transmitting member 50 integrally used, the shape of the prism 10 is extended, the description will be omitted. 在图示的棱镜10中，第1面S11的光轴与射出侦恍轴AX0相一致，第1面S11的本地坐标(x，y，z)与整体坐标(X，Y，Z)为平移关系，在第1面S11上具有原点。  illustrated in the prism 10, the first surface and the exit optical axis S11 AX0 axis coincides indistinct investigation, local coordinates (x, y, z) of the first surface S11 and the global coordinates (X, Y, Z ) a translation relation, having an origin on the first surface S11. 也就是说，本地坐标的z方向处于射出侧光轴AXO上成为行进方向（光线的逆进方向），本地坐标的y方向与整体坐标的Y方向平行。 That is, z be the direction of the local coordinates in the traveling direction (against the light advancing direction) on the exit side of the optical axis AXO, y direction of the local coordinates is parallel to the Y direction of the global coordinate. 在以后的各面中，本地坐标的y方向也与整体坐标的Y方向平行。 On each side of the future, y direction of the local coordinates is also parallel to the Y direction of the global coordinate. 第2面S12的光轴相对于射出侧光轴AX0适当倾斜，第2面S12的本地坐标相对于整体坐标绕Y轴适当旋转且平移，在第2面S12上具有原点。  S12 of the second optical axis with respect to the exit surface side of the optical axis AX0 appropriately inclined, second surface S12 of the local coordinates with respect to the global coordinate appropriate rotation about the Y axis and translation, with an origin on the second plane S12. 第2面S12的本地坐标的z方向为射出侦恍轴AX0和从第2面S12到第1面S11的光束中心的光轴AX1的中间方向。 The second surface S12 of the z direction of the local coordinates detect emitted indistinct axis AX1 and the optical axis AX0 medial direction from the second surface of the beam center S12 to S11 of the first surface. 第3面S13的光轴与射出侧光轴AX0相一致，第3面S13的本地坐标与整体坐标为平移关系，在第3面S13的延长面即第3透射面S53上具有原点。  axis of the third side surface S13 and the exit optical axis AX0 coincides, the local coordinates and global coordinates of the third surface S13 translational relationship, having an origin at the third surface, i.e. surface S13 extended third transmissive surface S53 . 通过以上，从第2面S12到第1面S11的光束中心的光轴AX1和从第1面S11到第3面S13的光束中心的光轴AX2的中间方向与第1面S11上的光束中心(光轴AX1、AX2的交点)处的第1面S11的法线方向相一致。  By the above, the medial direction from the first surface S12 to S11 of the second surface of the beam center of the optical axis AX1 and the optical axis AX2 of the center of the beam from the first surface to the third surface S11 and S13 of the first surface S11 the center of the beam (optical axis AX1, AX2 intersection point) coincides normal direction of the first surface of at S11. 并且，从第1面S11到第3面S13的光束中心的光轴AX2和从第3 面S13到第4面S14的光束中心的光轴AX3的中间方向与第3面S13上的光束中心(光轴AX2、 AX3的交点)处的第3面S13的法线方向相一致。 And, from the intermediate optical axis AX2 S11 to S13 of the third surface of the first surface of the beam center and the optical axis AX3 of the third surface from the center of the beam S13 to S14 of the fourth surface and the third surface S13 of the beam center ( the optical axis AX2, AX3 intersection of the normal direction) at the third surface S13 coincides. 在从第3面S13朝向下一个第4面S14的光路中，其本地坐标对应于行进方向（光线的逆进方向）。  from the optical path of a fourth surface S14 at S13 toward the third surface, which corresponds to the traveling direction of the local coordinates (light into the reverse direction). 也就是说，从第3面S13到第4面S14的本地坐标的z方向与光束中心的光轴AX3 相一致，该本地坐标的y方向与整体坐标的Y方向平行。 That is, the optical axis AX3 z coincides with the direction of the local coordinates of the center of the beam to the third surface S13 to S14 of the fourth surface, y direction of the local coordinates overall direction parallel to the Y coordinate. 第4面S14的本地坐标的原点处于该第4面S14上。 The origin of the local coordinate  S14 of the fourth surface is the fourth surface S14. 并且，第4面S14的本地坐标的z方向即第4面S14的光轴为从第3面S13到第4面S14的光束中心的光轴AX3和从第4面S14到第5 面S15的光束中心的光轴AX4的2等分线。 And, z direction of the local coordinates of the surface S14 of the fourth optical axis, i.e., the fourth surface S14 is the center of the beam from the optical axis AX3 of the third surface to the fourth surface S13 and S14 of the fourth surface from S14 to S15 of the fifth surface axis AX4 of the beam center bisector. 第5面S15的本地坐标的原点处于该第5面S15上。  origin of the local coordinates of the fifth surface S15 is in the fifth surface S15. 并且，第5面S15的本地坐标的z方向即第5面S15的光轴为从第4面S14到第5面S15的光束中心的光轴AX4和从第5面S15到第6 面S16的光束中心的光轴AX5的2等分线。 And, z direction of the local coordinates of the fifth surface S15, i.e., the optical axis of the fifth surface S15 S14 from the fourth surface to the fifth surface S15 of the beam center and the optical axis AX4 S15 to the sixth surface from the fifth surface S16 AX5 of the optical axis of the beam center bisector. 还有，第6面S16的光轴与光轴AX5相一致，与从图像显示装置80延伸的入射侧光轴AXI相一致。  Further, the sixth surface S16 with the optical axis of the optical axis AX5 consistent consistent with the optical axis of the incident side AXI means 80 extending from the image display. m、n为0以上的整数。  m, n is an integer of 0. 在此，A2m,n为多项式展开的第m • n项的系数。  Here, A2m, n • index n m for the first term of the polynomial expansion. 在此，A3m,n为多项式展开的第m • n项的系数。  Here, A3m, n • index n m for the first term of the polynomial expansion. 通过设定第1〜第3面S11〜S13的形状以满足这3个条件，能够良好地进行外界光HL和图像光GL的双方的像差校正，带来优异的像质。  By setting the shape of the 1 ~ S11~S13 third surface to satisfy these three conditions, aberration correction can be satisfactorily performed and the external light HL both the image light GL, bring about excellent image quality. 棱镜10的第1面S11和第3面S13的间隔为5mm以上且15mm以下。  The first prism surface 10 of the spacer S11 and S13 of the third surface is 5mm or more and 15mm or less. 并且，第2面S12相对于第1面S11的倾斜角为20°以上且40°以下。 And, with respect to the second surface S12 inclination angle of the first surface S11 is not less than 20 ° and 40 ° or less. 还有，关于棱镜10的第4面S14或第5面S15,用于光路的调整和/或像差的更加精密的校正而设置，考虑到投影透视装置70的规格等能够进行省略。  Further, on the fourth plane S14 or S15 fifth surface 10 of the prism, for adjusting an optical path and / or more precise aberration correction provided, taking into account the specifications of a perspective projection device 70 can be omitted . 在本实施方式的虚像显示装置100中，因为通过投影透镜30等在棱镜10的内部形成中间像，并按第3面S13、第1面S11及第2面S12的顺序在2个面以上全反射的图像光GL透射第1面S11而到达观看者的眼睛EY，所以能够使棱镜10薄型而使光学系统全体小型而轻量， 并实现广视角而明亮的高性能的显示。  In the present embodiment, the virtual image display device 100, since the intermediate image is formed inside the prism 10 through the projection lens 30 or the like, according to the third surface S13, S11 of the first surface and the second surface S12 in the order of 2 2 above the surface of the image light GL totally transmitting the first surface S11 and reaches the viewer's eye EY, it is possible to make small and thin and lightweight so that all of the prism 10 of the optical system, and bright wide viewing angle and high-performance display. 并且，关于外界光HL，例如能够通过第1面S11和第3 面S13进行观看，因为使此时的视度基本为0,所以能够降低当透视地观看外界光HL时的外界光HL的散焦和/或失真。 And, with respect to the external light HL, for example, can be viewed through the first surface and the third surface S11 S13, because at this time so that substantially zero diopter, can be reduced when viewed in perspective when outside light scattered outside light HL, HL coke and / or distortion. 并且，棱镜10的形状为按照观看者的面部的形状，重心既接近面部，设计也能够优异。 Further, the shape of the prism 10 is in the shape of the face of the viewer, as the center of gravity close to the face, can be excellent in design. 以下，关于组入于本发明涉及的虚像显示装置的投影透视装置的实施例进行说明。  Hereinafter, embodiments of a projection incorporated into the device in a perspective view apparatus according to the present invention will be described virtual image display. 将在各实施例中使用的记号归纳为以下。 The symbols in the Examples are summarized in the following using each embodiment. 将构成实施例1的投影透视装置之中的棱镜及投影透镜的光学面的数据示于以下的表1。  surfaces constituting the embodiment of the optical data into a perspective projection apparatus according to a prism and a projection lens are shown in Table 1 below. 还有，例如FFS1是指第1面S11，FFS2是指第2面S12，FFS3是指第3面S13,并且，ASP1是指投影透镜的第1透镜的射出面，ASP2是指第1透镜的入射面。 There are, for example, refers to the first surface FFS1 S11, FFS2 refers to the second surface S12, FFS3 refers to the third surface S13, and the, ASP1 refers to the first lens of the exit plane of the projection lens, ASP2 first lens means incident surface. 关于构成实施例1的棱镜中的光学面，将其横截面中的光轴倾斜角度(倾角)TLY和光轴偏离量(离心)DCX示于以下的表2。  The configuration of the optical surface of the prism in the Example 1 embodiment, the optical axis inclination angle (tilt angle) of its cross-section and the optical axis deviation amount TLY (centrifugal) DCX shown in Table 2 below. 关于构成实施例1的棱镜中的各光学面，将自由曲面的多项式展开的系数Akm,n示于以下的表3。  each optical surface constituting the prism in the Example 1 embodiment, the polynomial free-form surface coefficients of expansion Akm, n shown in Table 3 below. 还有，在表3中，记号m、n是指系数Akm,!^的变量或阶数。 Further, in Table 3, the symbols m, n refers to the coefficient Akm,! ^ Variables or order. 并且，记号FF% (k= 1 〜6)是指作为自由曲面的第1〜第6面SI 1〜S16之中的第k面。 Further, the sign FF% (k = 1 ~6) refers to the free surface of a sixth surface k-1 ~ SI surface among 1~S16. 还有，系数Akm,n是指构成表示作为对象的第k面的多项式的各项xm • 7"的系数。 Also, the coefficient Akm, n refers to the k-th polynomial representing the surface configuration of the object as the coefficient xm • 7 ". 在以上的表3及以下的表中，数值E以后是指10进制的指数部，例如所谓“一6.51比一03”是指一6.511\10一03。  In the above Table 3 and the following Table, after the decimal value E means exponential portion 10, for example, a so-called "a 03 a 6.51 ratio" refers to a 6.511 \ 10 a 03. 将构成实施例1的投影透视装置之中的投影透镜的光学面的非球面的系数示于以下的表4。  The embodiment of an optical surface constituting the projection lens in the projection apparatus 1 is a perspective view of the aspheric coefficients shown in Table 4 below. L0158」在以上的表4中，记号K、Bi表示用于对作为构成投影透镜30的3个透镜31、32、33的透镜面的非球面APS1〜APS6的非球面进行特定的系数。 L0158 "in the above Table 4, the symbol K, Bi expressed for a three aspheric lenses 30 APS1~APS6 the aspheric lens surface 32, 33 constituting the projection lens is specific coefficients. 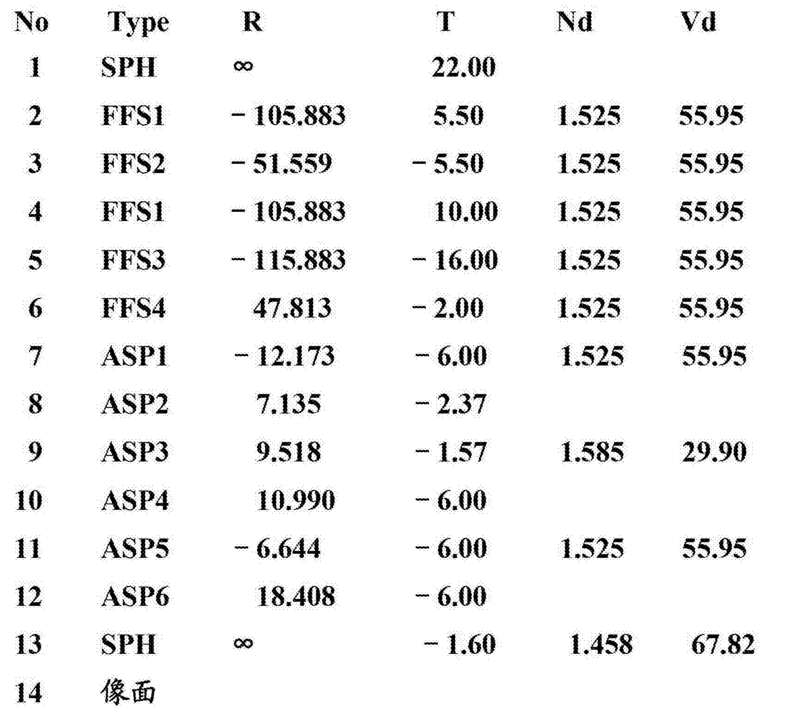 非球面通过以下的多项式(非球面式)而特定。 By the following polynomial aspheric surface (aspherical surface formula) and specific. 在此，R为各面的曲率半径，h为距光轴的高度，K为对象透镜面的圆锥系数，Bi(i =4、6、8、一）为对象透镜面的高阶非球面系数。  Here, R is the radius of curvature of each surface, h is the height from the optical axis, K is a conical coefficient of the lens surface of the object, Bi (i = 4,6,8, a) high-order object lens surface aspheric coefficients. 图5为实施例1的投影透视装置70的剖视图。  FIG. 5 is a perspective cross-sectional view of the projection apparatus 70 according to an embodiment. 但是，关于光束，不仅示出基准面SR上的光，也示出从基准面SR偏离于Y方向的光。 However, with respect to the light beam, not shown on the reference plane SR light, but also light from the reference surface SR shown deviates in the Y direction. 投影透视装置70之中的棱镜10具有：具有弱的负的折射力的第1面S11;具有比较强的正的折射力的第2面S12;具有比较弱的正的折射力的第3面S13;具有比较弱的负的折射力的第4面S14;具有比较弱的正的折射力的第5面S15; 和具有比较强的正的折射力的第6面S16。 Among the prism 70 is a perspective projection apparatus 10 has: a weak negative refractive power of the first surface S11; having a relatively strong positive refractive power of the surface 2 S12; having a relatively weak positive refractive power, the third surface S13; having a relatively weak negative refractive power of the fourth surface S14; having a relatively weak positive refractive power of the fifth surface S15; and having a relatively strong positive refractive power of the sixth surface S16. 投影透镜30具有:具有正的折射力的第1透镜31; 具有负的折射力的第2透镜32;和具有正的折射力的第3透镜33。 The projection lens 30 has: a first refractive power having a positive lens 31; the refractive power of the second lens 32 having a negative; and the refractive power of the third lens 33 having a positive. 若关于实施例1的光学系统的具体的规格进行说明，则水平视角为20.1°，垂直视角为11.4°，图像显示元件的显示区域的大小为9.22X5.18mm，瞳径(瞳孔直径)为5mm，焦点距离约为26mm。 If the specifications for specific optical system of Example 1 of the embodiment will be described, the horizontal viewing angle is 20.1 °, the vertical viewing angle is 11.4 °, the image size of the display area of ​​the display element is 9.22X5.18mm, pupil diameter (pupil diameter) of 5mm focal length of about 26mm. 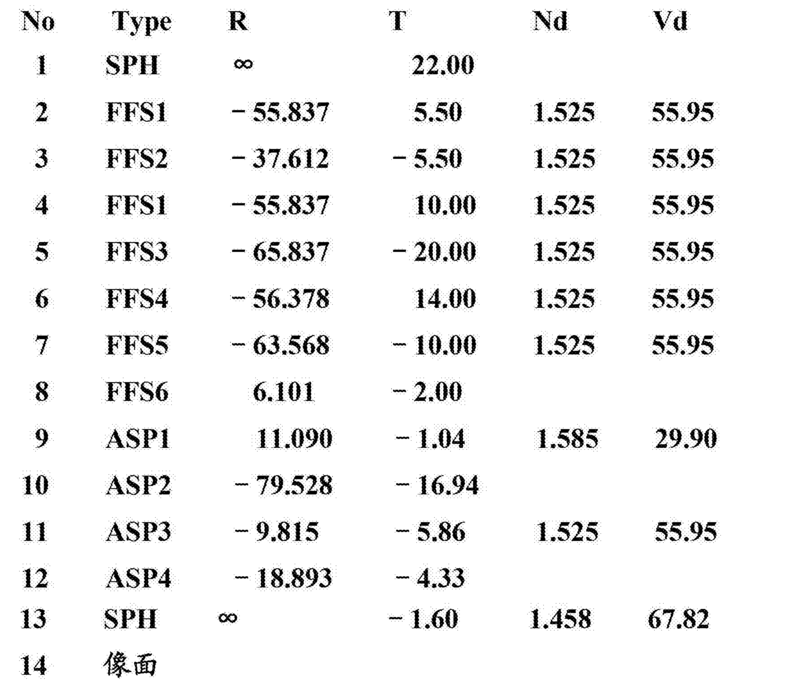 图6 (A)〜6 (F)及图7 (A)〜7 (F)表示实施例1的像差。  FIG. 6 (A) ~6 (F) and FIG. 7 (A) ~7 (F) show aberrations in Example 1 of the embodiment. 在各像差图中，横轴表示瞳孔的位置，纵轴以微米为单位表示像差量。 In each aberration diagram, the horizontal axis represents the position of the pupil, and the vertical axis represents aberration in units of microns. 具体地，图6(A)及6(B)表示在X方向为10°在Y方向为5.7 °的方位上的Y及X方向的像差，图6 (C)及6 (D)表示在X方向为0.0 °在Y方向为5.7 °的方位上的Y及X方向的像差，图6 (E)及6 (F)表示在X方向为一10°在Y方向为5.7°的方位上的Y及X方向的像差。 In particular, FIG. 6 (A) and 6 (B) shows the X-direction is 10 ° in the Y-direction aberrations in the Y and X direction and 5.7 ° in azimuth, FIG. 6 (C) and 6 (D) shows the the X direction is 0.0 ° and 5.7 ° in the Y direction of orientation of aberrations in the Y and X directions, FIG. 6 (E) and 6 (F) in the X direction is represented by a 10 ° Y-direction and 5.7 ° in azimuth on aberrations in the Y and X directions. 图7(A)及7(B)示出在X方向为10°在Y方向为0.0°的方位上的Y及X方向的像差，图7(C)及7①)表示在X方向为0.0°在Y方向为0.0°的方位上的Y及X方向的像差，图7(E) 及7 (F)表示在X方向为一10 °在Y方向为0.0 °的方位上的Y及X方向的像差。 FIG 7 (A) and 7 (B) shows the 10 ° in the X direction in the Y direction and X direction aberration Y on the azimuth of 0.0 °, FIG. 7 (C) and 7①) in the X direction represents 0.0 ° Y aberrations in the Y direction and the X direction on the azimuth of 0.0 °, FIG. 7 (E) and 7 (F) shows X and Y direction on the X Y directions in a 10 ° azimuth of 0.0 ° aberration direction. 还有，图示的像差量为了方便为使光线逆行的情况下的图像显示元件的像面上的像差量。 Further, the amount of aberration is illustrated for convenience in the case of image display light retrograde aberration amount on the image plane of the element. 将构成实施例2的投影透视装置之中的棱镜及投影透镜的光学面的数据示于以下的表5。 Data of the optical surface in a perspective projection apparatus of embodiment 2 of the prism and the projection lens  constituting the embodiment shown in Table 5 below. 关于构成实施例2的棱镜中的光学面，将其横截面中的光轴倾斜角度(倾角)TLY和光轴偏离量(离心)DCX示于以下的表6。  The configuration of the optical surface of the prism in the embodiment of Example 2, the optical axis inclination angle (tilt angle) of its cross-section and the optical axis deviation amount TLY (centrifugal) DCX shown in Table 6 below. 关于构成实施例2的棱镜中的各光学面将自由曲面的多项式展开的系数示于以下的表7。  each optical surface constituting the prism in embodiment 2 embodiment polynomial free-form surface coefficients of expansion shown in the following Table 7. 还有，在表7中，记号m、n是指系数Akm,n中的变量或阶数。 Further, in Table 7, symbols m, n refers to the coefficient Akm, n variables or order. 并且，记号FFSk (k = 1〜6)是指作为自由曲面的第1〜第6面S11〜S16之中的第k面。 Further, the sign FFSk (k = 1~6) refers to the first surface in the first k 1 ~ sixth surface S11~S16 as free-form surfaces. 将构成实施例2的投影透视装置之中的投影透镜的光学面的非球面的系数示于以下的表8。 Aspherical surface coefficient of the optical projection lens in a perspective projection apparatus of embodiment 2  The configuration of the embodiment shown in the following Table 8. 在以上的表8中，记号K、Bi表示对作为构成投影透镜30的3个透镜31、32、33的透镜面的非球面APS1〜APS6的非球面进行特定的系数。  In the above Table 8, the symbol K, Bi expressed as three lenses constituting the projection lens 30 is an aspheric surface of the aspheric lens 32, 33 APS1~APS6 be specific coefficients. 图8为实施例2的投影透视装置70的剖视图。  FIG. 8 is a cross-sectional perspective view of a projection apparatus 70 of the embodiment of Example 2. 投影透视装置70之中的棱镜10具有： 具有弱的负的折射力的第1面S11;具有比较强的正的折射力的第2面S12;具有比较弱的正的折射力的第3面S13;具有比较弱的负的折射力的第4面S14;具有比较弱的正的折射力的第5面S15;和具有比较强的正的折射力的第6面S16。 Among the prism 70 is a perspective projection apparatus 10 has: a weak negative refractive power of the first surface S11; having a relatively strong positive refractive power of the surface 2 S12; having a relatively weak positive refractive power, the third surface S13; having a relatively weak negative refractive power of the fourth surface S14; having a relatively weak positive refractive power of the fifth surface S15; and having a relatively strong positive refractive power of the sixth surface S16. 投影透镜30具有:具有正的折射力的第1透镜31;具有负的折射力的第2透镜32;和具有正的折射力的第3透镜33。 The projection lens 30 has: a first refractive power having a positive lens 31; the refractive power of the second lens 32 having a negative; and the refractive power of the third lens 33 having a positive. 若关于实施例2的光学系统的具体的规格进行说明，则水平视角为20.1°，垂直视角为11.4°，图像显示元件的显示区域的大小为9.22X5.18mm，瞳径为5mm，焦点距离约为26mm。 If the specifications for specific optical system of Example 2 of the embodiment will be described, the horizontal viewing angle is 20.1 °, the vertical viewing angle is 11.4 °, the image size of the display area of ​​the display element is 9.22X5.18mm, pupil diameter is 5mm, the focal distance of about It is 26mm. 图9 (A)〜9 (F)及图10 (A)〜10 (F)表示实施例2的像差。  FIG. 9 (A) ~9 (F) and FIG. 10 (A) ~10 (F) show aberrations of Example 2. 具体地，图9 (A)及9 (B)表示在X方向为10 °在Y方向为5.7 °的方位上的Y及X方向的像差，图9 (C)及9 (D)表示在X方向为0.0°在Y方向为5.7°的方位上的Y及X方向的像差，图9(E)及9(F)表示在X方向为一10°在Y方向为5.7°的方位上的Y及X方向的像差。 In particular, FIG. 9 (A) and 9 (B) indicates the aberration in the X direction and the Y direction on the X 10 ° and 5.7 ° in the Y-direction orientation in FIG. 9 (C) and 9 (D) shows the the X direction is 0.0 ° and 5.7 ° in the Y direction of orientation of aberrations in the Y and X directions, FIG. 9 (E) and 9 (F) is represented in the X direction on a 10 ° Y-direction and 5.7 ° in azimuth aberrations in the Y and X directions. 图10(A)及10(B)表示在X方向为10°在Y方向为0.0° 的方位上的Y及X方向的像差，图10 (C)及10 (D)表示在X方向为0.0°在Y方向为0.0°的方位上的Y及X方向的像差，图10 (E)及10 (F)表示在X方向为一10 °在Y方向为0.0 °的方位上的Y及X 方向的像差。 FIG 10 (A) and 10 (B) shows the X-direction is 10 ° in the Y-direction aberrations in the Y and X directions on the azimuth of 0.0 °, FIG. 10 (C) and 10 (D) as represented in the X direction and aberrations in the Y direction on the X 0.0 ° and 0.0 ° in the Y-direction orientation of FIG. 10 (E) and 10 (F) shows a 10 ° X direction in the Y direction and 0.0 ° in azimuth and Y aberration in the X direction. 将构成实施例3的投影透视装置之中的棱镜及投影透镜的光学面的数据示于以下的表9。  surfaces constituting the embodiment of the optical data into a perspective projection apparatus of the third prism and the projection lens are shown in Table 9 below. 关于构成实施例3的棱镜中的光学面，将其横截面中的光轴倾斜角度(倾角)TLY和光轴偏离量(离心)DCX示于以下的表10。  The configuration of the optical surface of the prism in embodiment 3 embodiment, the optical axis inclination angle (tilt angle) of its cross-section and the optical axis deviation amount TLY (centrifugal) DCX shown in the following Table 10. 关于构成实施例3的棱镜中的各光学面将自由曲面的多项式展开的系数示于以下的表11。  For each optical surface of the prism constituting the embodiment of the embodiment 3 will free-form surface coefficients of the polynomial expansion are shown in the following Table 11. 还有，在表11中，记号m、n是指系数Akm,!^的变量或阶数。 Further, in Table 11, marks m, n refers to the coefficient Akm,! ^ Variables or order. 并且，记号FFSk(k=l〜5) 是指作为自由曲面的第1〜第5面S11〜S15之中的第k面。 Further, the sign FFSk (k = l~5) refers to the k-th surface in the first surface 1 ~ 5 S11~S15 as free-form surfaces. 将构成实施例3的投影透视装置之中的投影透镜的光学面的非球面的系数示于以下的表12。 Aspherical surface coefficient of the optical projection lens in a perspective projection apparatus of Example 3  The configuration of the embodiment shown in the following Table 12. 在以上的表12中，记号K、Bi表示用于对作为构成投影透镜30的3个透镜31、32、33 的透镜面的非球面APS1〜APS6的非球面进行特定的系数。  In the above Table 12, marks K, Bi expressed for a three aspheric lenses 30 APS1~APS6 the aspheric lens surface 32, 33 constituting the projection lens is specific coefficients. 图11为实施例3的投影透视装置70的剖视图。  Figure 11 a perspective cross-sectional view of the projection device 70 of Example 3. 投影透视装置70之中的棱镜10具有： 具有弱的负的折射力的第1面S11;具有比较强的正的折射力的第2面S12;具有比较弱的正的折射力的第3面S13;具有比较强的正的折射力的第4面S14;和具有比较弱的负的折射力的第5面S15。 Among the prism 70 is a perspective projection apparatus 10 has: a weak negative refractive power of the first surface S11; having a relatively strong positive refractive power of the surface 2 S12; having a relatively weak positive refractive power, the third surface S13; having a relatively strong positive refractive power of the fourth surface S14; negative refractive power and a fifth surface S15 having a relatively weak. 在此，第4面S14与实施例1等不同，作为反射面及折射面而起作用。 In this case, the fourth surface S14 and different from Example 1 and other embodiments, as the refractive surface and reflective surface to function. 具体地，第4 面S14相对于从第3面S13逆行的光束(实际上为来自第5面S15的光)为全反射面，相对于从第5面S15逆行的光束(实际上为来自投影透镜30的光)为透射面。 Specifically, the first light beam 4 with respect to the surface S14 (actually, from the fifth surface S15 of the light) retrograde from the third surface S13 of the total reflection surface with respect to the retrograde beam from the fifth surface S15 (actually, from the projection the optical lens 30) is a transmitting surface. 也就是说，第4面S14关于光路的折弯具有与实施例1的第4面S14同样的功能，关于光束的会聚兼备实施例1的第6面S16的功能。 That is, the fourth folding surface S14 on the optical path having the same function as the fourth surface S14 of Example 1, Example 1 the function of the sixth surface S16 of the light beam converged on both embodiments. 投影透镜30具有:具有正的折射力的第1透镜31;具有负的折射力的第2透镜32; 和具有正的折射力的第3透镜33。 The projection lens 30 has: a first refractive power having a positive lens 31; the refractive power of the second lens 32 having a negative; and the refractive power of the third lens 33 having a positive. 若关于实施例3的光学系统的具体的规格进行说明，则水平视角为20.1°，垂直视角为11.4°，图像显示元件的显示区域的大小为9.22X5.18mm，瞳径为5mm，焦点距离约为26mm。 If the specifications for specific optical system of Example 3 of the embodiment will be described, the horizontal viewing angle is 20.1 °, the vertical viewing angle is 11.4 °, the image size of the display area of ​​the display element is 9.22X5.18mm, pupil diameter is 5mm, the focal distance of about It is 26mm. 图12 (A)〜12 (F)及图13 (A)〜13 (F)表示实施例3的像差。  FIG. 12 (A) ~12 (F) and FIG. 13 (A) ~13 (F) show aberrations in Example 3 of the embodiment. 具体地，图12 (A)及12 (B) 表示在X方向为10 °在Y方向为5.7 °的方位上的Y及X方向的像差，图12 (C)及12 (D)表示在X方向为0.0°在Y方向为5.7°的方位上的Y及X方向的像差，图12(E)及12(F)表示在X方向为一10°在Y方向为5.7°的方位上的Y及X方向的像差。 In particular, FIG. 12 (A) and 12 (B) shows the X-direction is 10 ° in the Y-direction aberrations in the Y and X direction and 5.7 ° in azimuth, FIG. 12 (C) and 12 (D) shows the X direction and 0.0 ° in the Y-direction aberrations in the Y and X direction and 5.7 ° in azimuth, FIG. 12 (E) and 12 (F) shows a 10 ° X direction and 5.7 ° in the Y direction on the azimuth aberrations in the Y and X directions. 图13(A)及13(B)表示在X方向为10°在Y方向为0.0°的方位上的Y及X方向的像差，图13(C)及13(D)表示在X方向为0.0°在Y方向为0.0° 的方位上的Y及X方向的像差，图13(E)及13(F)表示在X方向为一10°在Y方向为0.0°的方位上的Y及X方向的像差。 FIG 13 (A) and 13 (B) shows the X-direction is 10 ° in the Y-direction aberrations in the Y and X directions on the azimuth of 0.0 °, FIG. 13 (C) and 13 (D) as represented in the X direction and aberrations in the Y direction on the X 0.0 ° and 0.0 ° in the Y-direction orientation of FIG. 13 (E) and 13 (F) shows a 10 ° X direction in the Y direction and 0.0 ° in azimuth and Y aberration in the X direction. 将构成实施例4的投影透视装置之中的棱镜及投影透镜的光学面的数据示于以下的表13。  surfaces constituting the embodiment of the optical data into a perspective projection apparatus and a projection lens 4, a prism is shown in the following Table 13. 关于构成实施例4的棱镜中的光学面，将其横截面中的光轴倾斜角度(倾角)TLY和光轴偏离量(离心)DCX示于以下的表14。  The configuration of the optical surface of the prism in embodiment 4 embodiment, the optical axis inclination angle (tilt angle) of its cross-section and the optical axis deviation amount TLY (centrifugal) DCX shown in the following Table 14. 关于构成实施例4的棱镜中的各光学面将自由曲面的多项式展开的系数示于以下的表15。  each optical surface constituting the prism in embodiment 4 embodiment polynomial free-form surface coefficients of expansion shown in the following Table 15. 还有，在表15中，记号m、n是指系数Akm,n中的变量或阶数。 Further, in Table 15, the symbols m, n refers to the coefficient Akm, n variables or order. 并且，记号FFSk(k=l〜6) 是指作为自由曲面的第1〜第6面S11〜S16之中的第k面。 Further, the sign FFSk (k = l~6) refers to the first surface in the first k 1 ~ sixth surface S11~S16 as free-form surfaces. 将构成实施例4的投影透视装置之中的投影透镜的光学面的非球面的系数示于以下的表16。  The aspherical coefficients constituting the embodiment of the optical surface of the projection lens in a perspective projection apparatus of Embodiment 4 shown in the following Table 16. 在以上的表16中，记号K、Bi表示用于对作为构成投影透镜30的2个透镜31、32的透镜面的非球面APS1〜APS4的非球面进行特定的系数。  In the above Table 16, the symbol K, Bi represents the coefficients to be used for a particular lens 30 as two aspherical lens surfaces of an aspheric APS1~APS4 constituting the projection lens 31, 32. 图14为实施例4的投影透视装置70的剖视图。  Figure 14 a perspective cross-sectional view of the projection device 70 of Example 4. 投影透视装置70之中的棱镜10具有： 具有弱的负的折射力的第1面S11;具有比较强的正的折射力的第2面S12;具有比较弱的正的折射力的第3面S13;具有比较弱的负的折射力的第4面S14;具有比较弱的正的折射力的第5面S15;和具有比较强的正的折射力的第6面S16。 Among the prism 70 is a perspective projection apparatus 10 has: a weak negative refractive power of the first surface S11; having a relatively strong positive refractive power of the surface 2 S12; having a relatively weak positive refractive power, the third surface S13; having a relatively weak negative refractive power of the fourth surface S14; having a relatively weak positive refractive power of the fifth surface S15; and having a relatively strong positive refractive power of the sixth surface S16. 也就是说，实施例4的棱镜10具有与实施例1同样的第1〜第6面S11〜S16。 That is, the prism 10 of Example 4 with Example 1 ~ 6 of the same surface S11~S16 1. 投影透镜30具有:具有负的折射力的第1透镜31;和具有正的折射力的第2透镜32。 The projection lens 30 has: a negative refractive power of the first lens 31; and a second lens having a positive refractive power 32. 若关于实施例4的光学系统的具体的规格进行说明，则水平视角为20.1°，垂直视角为11.4°，图像显示元件的显示区域的大小为9.22X5.18mm，瞳径为5mm， 焦点距离约为26mm。 If on the particular specifications of the optical system of the embodiment will be described in Example 4, the horizontal viewing angle is 20.1 °, the vertical viewing angle is 11.4 °, the image size of the display area of ​​the display element is 9.22X5.18mm, pupil diameter is 5mm, the focal distance of about It is 26mm. 图15 (A)〜15 (F)及图16 (A)〜16 (F)表示实施例4的像差。  FIG. 15 (A) ~15 (F) and FIG. 16 (A) ~16 (F) of Example 4 show aberrations. 具体地，图15 (A)及15 (B) 表示在X方向为10 °在Y方向为5.7 °的方位上的Y及X方向的像差，图15 (C)及15 (D)表示在X方向为0.0°在Y方向为5.7°的方位上的Y及X方向的像差，图15(E)及15(F)表示在X方向为一10°在Y方向为5.7°的方位上的Y及X方向的像差。 In particular, FIG. 15 (A) and 15 (B) indicates the aberration in the X direction and the Y direction on the X 10 ° and 5.7 ° in the Y-direction orientation of FIG. 15 (C) and 15 (D) shows the the X direction is 0.0 ° and 5.7 ° in the Y direction of orientation of aberrations in the Y and X directions, FIG. 15 (E) and 15 (F) is represented in the X direction on a 10 ° Y-direction and 5.7 ° in azimuth aberrations in the Y and X directions. 图16(A)及16(B)表示在X方向为10°在Y方向为0.0°的方位上的Y及X方向的像差，图16(C)及16(D)表示在X方向为0.0°在Y方向为0.0° 的方位上的Y及X方向的像差，图16(E)及16(F)表示在X方向为一10°在Y方向为0.0°的方位上的Y及X方向的像差。 FIG 16 (A) and 16 (B) shows the X-direction is 10 ° in the Y-direction aberrations in the Y and X directions on the azimuth of 0.0 °, FIG. 16 (C) and 16 (D) as represented in the X direction and aberrations in the Y direction on the X 0.0 ° and 0.0 ° in the Y-direction orientation of FIG. 16 (E) and 16 (F) shows a 10 ° X direction in the Y direction and 0.0 ° in azimuth and Y aberration in the X direction. 将构成实施例5的投影透视装置之中的棱镜及投影透镜的光学面的数据示于以下的表17。 Data of the optical surface in a perspective projection apparatus of embodiment 5 of the prism and the projection lens  The configuration of the embodiment shown in the following Table 17. 关于构成实施例5的棱镜中的光学面，将其横截面中的光轴倾斜角度(倾角)TLY和光轴偏离量(离心)DCX示于以下的表18。  The configuration of the optical surface of the prism in embodiment 5 embodiment, the optical axis inclination angle (tilt angle) of its cross-section and the optical axis deviation amount TLY (centrifugal) DCX shown in the following Table 18. 关于构成实施例5的棱镜中的各光学面将自由曲面的多项式展开后的系数示于以下的表19。  The configuration of the coefficient embodiment each optical surface of the prism in embodiment 5 expanded polynomial free-form surface are shown in Table 19 below. 还有，在表19中，记号m、n是指系数Akm,!^的变量或阶数。 Further, in Table 19, marks m, n refers to the coefficient Akm,! ^ Variables or order. 并且，记号FF%(k=l〜 5)是指作为自由曲面的第1〜第5面S11〜S15之中的第k面。 Further, the sign FF% (k = l~ 5) refers to the k-th surface in the first surface 1 ~ 5 S11~S15 as free-form surfaces. 将构成实施例5的投影透视装置之中的投影透镜的光学面的非球面的系数示于以下的表20。 Aspherical surface coefficient of the optical projection lens in a perspective projection apparatus of Example 5  The configuration of the embodiment shown in the following Table 20. 在以上的表20中，记号K、Bi表示用于对作为构成投影透镜30的3个透镜31、32、33 的透镜面的非球面APS1〜APS6的非球面进行特定的系数。  In the above Table 20, marks K, Bi expressed for a three lenses constituting the projection lens 30 aspheric APS1~APS6 aspherical lens surfaces 32, 33 will be a specific factor. 图17为实施例5的投影透视装置70的剖视图。  Figure 17 a perspective cross-sectional view of the projection device 70 of Example 5. 投影透视装置70之中的棱镜10具有： 具有弱的负的折射力的第1面S11;具有比较强的正的折射力的第2面S12;具有比较弱的正的折射力的第3面S13;具有比较弱的负的折射力的第4面S14;和具有比较强的正的折射力的第5面S15。 Among the prism 70 is a perspective projection apparatus 10 has: a weak negative refractive power of the first surface S11; having a relatively strong positive refractive power of the surface 2 S12; having a relatively weak positive refractive power, the third surface S13; having a relatively weak negative refractive power of the fourth surface S14; positive refractive power and a fifth surface S15 having relatively strong. 在此，第5面S15关于光束的会聚具有实施例1的第6面S16的功能。 Here, the fifth surface S15 on S16 convergent beam having a function of surface 6 of Example 1. 也就是说，图17的实施例5能够视为省略了示于图5的实施例1的第1〜第6面S11〜S16之中的第5面S15的实施例。 That is, the embodiment 17 of FIG. 5 can be regarded as an embodiment of the fifth surface S15 in the first embodiment S11~S16 1 ~ sixth surface 5 of the embodiment shown in FIG. 1 is omitted. 投影透镜30具有:具有正的折射力的第1透镜31;具有负的折射力的第2透镜32;和具有正的折射力的第3透镜33。 The projection lens 30 has: a first refractive power having a positive lens 31; the refractive power of the second lens 32 having a negative; and the refractive power of the third lens 33 having a positive. 若关于实施例5的光学系统的具体的规格进行说明，则水平视角为20.1°，垂直视角为11.4°，图像显示元件的显示区域的大小为9.22X5.18mm，瞳径为5mm，焦点距离约为26mm。 If on the particular specifications of the optical system of the embodiment will be described in Example 5, the horizontal viewing angle is 20.1 °, the vertical viewing angle is 11.4 °, the image size of the display area of ​​the display element is 9.22X5.18mm, pupil diameter is 5mm, the focal distance of about It is 26mm. 图18 (A)〜18 (F)及图19 (A)〜19 (F)表示实施例5的像差。  FIG. 18 (A) ~18 (F) and FIG. 19 (A) ~19 (F) show aberrations of Example 5. 具体地，图18 (A)及18 (B) 表示在X方向为10 °在Y方向为5.7 °的方位上的Y及X方向的像差，图18 (C)及18 (D)表示在X方向为0.0°在Y方向为5.7°的方位上的Y及X方向的像差，图18(E)及18(F)表示在X方向为一10°在Y方向为5.7°的方位上的Y及X方向的像差。 In particular, FIG. 18 (A) and 18 (B) indicates the aberration in the X direction and the Y direction on the X 10 ° and 5.7 ° in the Y-direction orientation of FIG. 18 (C) and 18 (D) shows the the X direction is 0.0 ° and 5.7 ° in the Y direction of orientation of aberrations in the Y and X directions, FIG. 18 (E) and 18 (F) shows a 10 ° X direction and 5.7 ° in the Y direction on the azimuth aberrations in the Y and X directions. 图19(A)及19(B)表示在X方向为10°在Y方向为0.0°的方位上的Y及X方向的像差，图19(C)及19(D)表示在X方向为0.0°在Y方向为0.0° 的方位上的Y及X方向的像差，图19(E)及19(F)表示在X方向为一10°在Y方向为0.0°的方位上的Y及X方向的像差。 FIG 19 (A) and 19 (B) shows the X-direction is 10 ° in the Y-direction aberrations in the Y and X directions on the azimuth of 0.0 °, FIG. 19 (C) and 19 (D) as represented in the X direction and aberrations in the Y direction on the X 0.0 ° and 0.0 ° in the Y-direction orientation of FIG. 19 (E) and 19 (F) shows a 10 ° X direction in the Y direction and 0.0 ° in azimuth and Y aberration in the X direction. 将构成实施例6的投影透视装置之中的棱镜及投影透镜的光学面的数据示于以下的表21。 Data of the optical surface in a perspective projection apparatus of embodiment 6 prism and the projection lens  The configuration of the embodiment shown in the following Table 21. 关于构成实施例6的棱镜中的光学面，将其横截面中的光轴倾斜角度(倾角)TLY和光轴偏离量(离心)DCX示于以下的表22。  The configuration of the optical surface of the prism in embodiment 6 embodiment, the optical axis inclination angle (tilt angle) of its cross-section and the optical axis deviation amount TLY (centrifugal) DCX shown in the following Table 22. 关于构成实施例6的棱镜中的各光学面将自由曲面的多项式展开的系数示于以下的表23。  Embodiment constituting each optical surface of the prism in embodiment 6 of the free-form surface coefficients of the polynomial expansion are shown in the following Table 23. 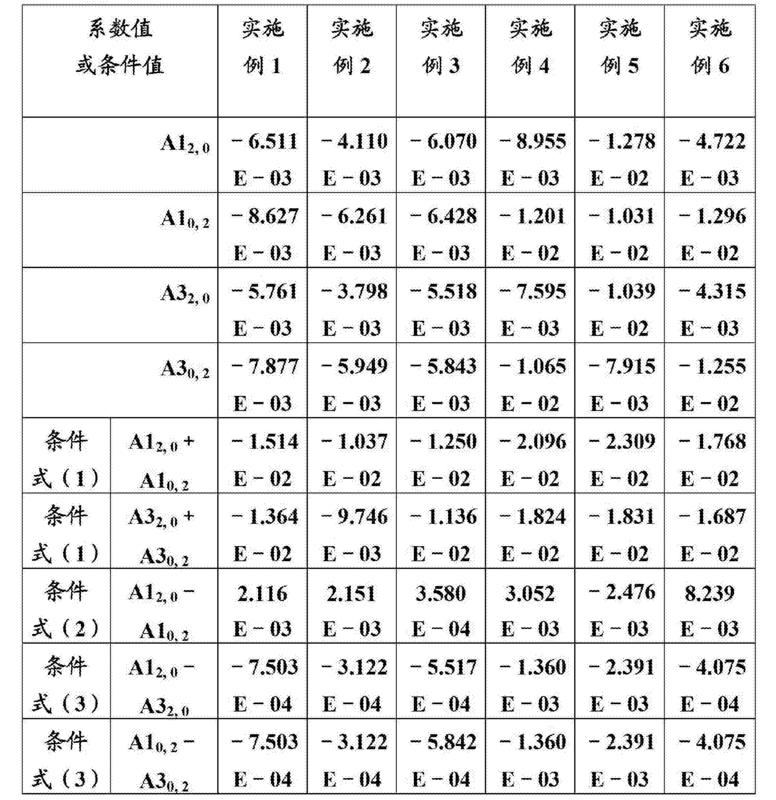 还有，在表23中，记号m、n是指系数Akm,n中的变量或阶数。 Further, in Table 23, marks m, n refers to the coefficient Akm, n variables or order. 并且，记号FFSk(k=l〜4) 是指作为自由曲面的第1〜第4面S11〜S14之中的第k面。 Further, the sign FFSk (k = l~4) refers to the first surface in the first k 1 ~ fourth surface S11~S14 free-form surfaces. 将构成实施例6的投影透视装置之中的投影透镜的光学面的非球面的系数示于以下的表24。 Aspherical surface coefficient of the optical projection lens in a perspective projection apparatus of Embodiment 6  The configuration of the embodiment shown in the following Table 24. 在以上的表24中，记号K、Bi表示用于对作为构成投影透镜30的3个透镜31、32、33 的透镜面的非球面APS1〜APS6的非球面进行特定的系数。  In the above Table 24, marks K, Bi expressed for a three aspheric lenses 30 APS1~APS6 the aspheric lens surface 32, 33 constituting the projection lens is specific coefficients. 图20为实施例6的投影透视装置70的剖视图。  FIG. 20 is a cross-sectional perspective view of a projection apparatus 70 of Example 6. 投影透视装置70之中的棱镜10具有： 具有弱的负的折射力的第1面S11;具有比较强的正的折射力的第2面S12;具有比较弱的正的折射力的第3面S13;和具有比较强的正的折射力的第4面S14。 Among the prism 70 is a perspective projection apparatus 10 has: a weak negative refractive power of the first surface S11; having a relatively strong positive refractive power of the surface 2 S12; having a relatively weak positive refractive power, the third surface S13; and refractive power of the fourth surface S14 having a relatively strong positive. 在此，第4面S14关于光束的会聚具有实施例1的第6面S16的功能。 In this case, the fourth surface S14 on S16 convergent beam having a function of surface 6 of Example 1. 也就是说，图20的实施例6能够视为省略了示于图5的实施例1的第1〜第6面S11〜S16之中的第4面S14及第5面S15的实施例。 That is, the embodiment 20 of FIG. 6 can be regarded as an embodiment of the fourth surface and the fifth surface S15 S14 among 1 ~ sixth surface S11~S16 first embodiment illustrated in FIG 1 is omitted. 投影透镜30具有:具有正的折射力的第1透镜31;具有负的折射力的第2透镜32;和具有正的折射力的第3透镜33。 The projection lens 30 has: a first refractive power having a positive lens 31; the refractive power of the second lens 32 having a negative; and the refractive power of the third lens 33 having a positive. 若关于实施例6的光学系统的具体的规格进行说明，则水平视角为20.1°，垂直视角为11.4°，图像显示元件的显示区域的大小为9.22X5.18mm，瞳径为5mm，焦点距离约为26mm。 If the specifications for specific optical system of Example 6 of the embodiment will be described, the horizontal viewing angle is 20.1 °, the vertical viewing angle is 11.4 °, the image size of the display area of ​​the display element is 9.22X5.18mm, pupil diameter is 5mm, the focal distance of about It is 26mm. 图21 (A)〜21 (F)及图22 (A)〜22(F)表示实施例6的像差。  FIG. 21 (A) ~21 (F) and FIG. 22 (A) ~22 (F) show aberrations of Example 6. 具体地，图21 (A)及21 (B) 表示在X方向为10°在Y方向为5.7°的方位上的Y及X方向的像差，图21 (C)及21 (D)表示在X方向为0.0°在Y方向为5.7°的方位上的Y及X方向的像差，图21(E)及21(F)表示在X方向为一10°在Y方向为5.7°的方位上的Y及X方向的像差。 In particular, FIG. 21 (A) and 21 (B) shows the X-direction is 10 ° in the Y-direction aberrations in the Y and X direction and 5.7 ° in azimuth, FIG. 21 (C) and 21 (D) shows the X direction and 0.0 ° in the Y-direction aberrations in the Y and X direction and 5.7 ° in azimuth, FIG. 21 (E) and 21 (F) shows a 10 ° X direction and 5.7 ° in the Y direction on the azimuth aberrations in the Y and X directions. 图22(A)及22(B)表示在X方向为10°在Y方向为〇. 〇°的方位上的Y及X方向的像差，图22 (C)及22 (D)表示在X方向为0.0 °在Y方向为0.0° 的方位上的Y及X方向的像差，图22(E)及22(F)表示在X方向为一10°在Y方向为0.0°的方位上的Y及X方向的像差。 FIG. 22 (A) and 22 (B) indicates the aberration in the X direction and the Y direction on the X in the Y direction is 10 ° square. Billion ° azimuth, FIG. 22 (C) and 22 (D) shows X 0.0 ° in the Y-direction aberrations in the Y direction and the X direction on the azimuth of 0.0 °, FIG. 22 (E) and 22 (F) represented in the X direction is the Y direction in a 10 ° azimuth of 0.0 ° aberrations in the Y and X directions. 在以下的表25,关于各实施例1〜6,归纳关于条件式(1)〜(3)的数值数据。  In the following Table 25, the respective examples 1~6 summed values ​​related to the conditional expressions (1) to (3). 并且，在以下的表26,关于各实施例1〜6,归纳关于第1面S11和第3面S13的间隔及第2面S12相对于第1面S11的倾斜角的数值数据。  Further, in the following Table 26, the respective examples 1~6, S11 and S13 are summarized in the second space between the third surface S12 values ​​related to the second surface of the first surface with respect to the angle of inclination of the first surface S11. Dy = 2000(N—1) (A1o,2—A3o,2+(2T(N—1)/N) XA1o,2XA3o,2)。  Dy = 2000 (N-1) (A1o, 2-A3o, 2 + (2T (N-1) / N) XA1o, 2XA3o, 2). 基于上式，在以下的表27,归纳关于各实施例1〜6的关于视度的数值数据。  Based on the formula, in the following Table 27, numeric data summarized in the respective examples 1~6 depending on degree. 虽然以上就各实施方式对本发明进行了说明，但是本发明并不限于所述的实施方式，在不脱离其主旨的范围内可以在各种方式下实施，例如也可以为如下的变形。  Although the following modifications to the above embodiments of the present invention has been described, but the present invention is not limited to the embodiments described, can be practiced in various manners without departing from the scope thereof, for example, may be a . 虽然在所述的说明中，半透射半反射镜层(半透射半反射膜）15形成为横长的矩形区域，但是半透射半反射镜层15的轮廓能够相应于用途及其他的使用而适当变更。  In the above description, the semitransparent mirror layer (semi-transmissive semi-reflective film) 15 is formed as a horizontally long rectangular area, but the profile of the semi-reflective mirror layer 15 can correspond to other uses and use appropriate changes. 并且，半透射半反射镜层15的透射率和/或反射率也能够相应于用途等而变更。 Further, the transmittance 15 of the semi-transmissive and / or reflectance of the half mirror layer corresponding to the use and the like can be changed. 虽然在所述的说明中，并未对图像显示元件82中的显示辉度的分布特别进行调整，但是在根据位置而产生辉度差等的情况下，能够将显示辉度的分布调整为不均等。  In the above description, the image is not displayed on the luminance distribution in the display element 82 is adjusted in particular, but in poor luminance is generated according to the position of the case, the distribution of luminance can be displayed adjusted to unequal. 虽然在所述的说明中，作为图像显示装置80,采用包括透射型的液晶显示器件等的图像显示元件82,但是作为图像显示装置80,并不限于包括透射型的液晶显示器件等的图像显示元件82而可以利用各种元件。  In the above description, as the image display device 80, including an image using a transmission type liquid crystal display device such as a display device 82, but as an image display device 80, including not limited to a transmissive liquid crystal display device, etc. the image display element 82 and various elements may be utilized. 例如，既可以为采用反射型的液晶显示器件的构成， 也能够代替包括液晶显示器件等的图像显示元件82而采用数字微镜器件等。 For example, using the configuration that either a reflection type liquid crystal display device, it is possible to place a liquid crystal display device includes an image display element 82 and the like using a digital micromirror device or the like. 并且，作为图像显示装置80，也能够采用为LED阵列和/或0LED (有机EL)等所代表的自发光型元件。 Further, as the image display device 80, it is possible to use a self-luminous element is an LED array and / or 0LED (organic EL) and the like represented. 虽然在所述实施方式中，采用包括透射型的液晶显示器件等的图像显示装置80， 但是也能够代之于采用扫描型的图像显示装置。  Although in the embodiment described above, using an image including a transmission type liquid crystal display device such as display device 80, it is also possible to use instead of the scanning type image display apparatus. 具体地如示于图23地，作为虚像显示装置的第1显示装置100A具备导光部20和图像显示装置380。  Specifically, as shown in FIG. 23, the virtual image display device of the first display device 100A includes the light guide portion 20 and the image display device 380. 因为导光部20相当于所述实施方式的图1中的第1光学部分103a，即相当于使棱镜10和光透射构件50相接合所得的构件，所以在此将说明进行省略。 Since the light guide portion 20 corresponds to the embodiment in FIG. 1 a first embodiment of the optical portion 103a, the prism 50 is equivalent to the resultant engagement member 10 and the light-transmitting member, so the description will be omitted here. 图像显示装置380 为形成强度调制的信号光并使该信号光作为扫描光TL射出的装置，具有信号光形成部381 和扫描光学系统382。 The image display device 380 is formed as an optical signal intensity-modulated light and the signal TL as an optical scanning device emitted light forming unit 381 includes a signal and a scanning optical system 382. 信号光形成部381具备光源，射出基于来自未图示的控制电路的控制信号进行调制而形成的信号光LL。  the signal light forming unit 381 includes a light source that emits light LL signal a control signal from the control circuit (not shown) is modulated based on the formation. 扫描光学系统382使经由信号光形成部381的信号光LL边扫描边射出。 A scanning optical system 382 is formed so that the optical signal via the signal portion 381 while scanning the light LL emitted. 在此，扫描光学系统382以MEMS镜等构成，进行如下的2维扫描:通过同步于通过信号光形成部381进行的信号光LL的调制使姿势变化对信号光LL的光路进行调整而使光线（扫描光TL)的射出角度纵横地变化。 Here, the scanning optical system 382 to the MEMS mirror or the like, following the two-dimensional scanning: By synchronizing to a signal by the signal light forming unit 381 light LL modulated so that the posture change of the signal light LL, an optical path is adjusted so that the light (scanning light TL) is emitted to the aspect angle change. 通过以上，图像显示装置380使应当成为图像光GL的扫描光TL入射于导光部20并相对于第2面S12之中的形成半透射半反射镜层15的部分区域的整体扫描。 By the above, the image display device 380 so that image light GL should be the scanning light TL 20 and integral part of the scanning region is incident on the light guide portion is formed with respect to the second surface S12 among the semi-reflective mirror layer 15. 若关于图示的第1显示装置100A的工作进行说明，则图像显示装置380如所述地， 以信号光LL为扫描光TL朝向导光部20的第6面S16射出。  When the work on the illustrated first display device 100A will be described, the image display device 380, as mentioned, in order to scan the signal light LL light TL toward the light guide portion 20 of the sixth surface S16 is emitted. 导光部20使通过了第6面S16的扫描光TL通过全反射等在内部导光，到达半透射半反射镜层15。 The light guide portion 20 so that the scanning by the sixth surface S16 of the light guide TL by total reflection inside the light arriving at the semitransparent mirror layer 15. 此时，通过扫描光TL在半透射半反射镜层15的面上扫描，通过作为扫描光TL的轨迹的图像光GL形成虚像，通过配戴者以眼睛EY捕捉该虚像，观看图像。 In this case, the semi-reflective mirror surface layer 15 is scanned, the scanning light TL is formed by the image light GL as the scanning light TL locus virtual image, by the wearer in order to capture the eye EY virtual image viewing image. 还有，在图示的情况下，导光部20之中的作为光入射面的第6面S16相对于扫描光TL的光轴为垂直的平面。 Further, in the illustrated case, the light guide portion 20 in the sixth surface S16 with respect to a light incident surface of the optical axis of the scanning light TL perpendicular to the plane. 并且，第5面S15及第4面S14也是平面。 And, the fifth surface and the fourth surface S14 S15 are plane. 并且，虽然在所述实施方式中构成为，作为导光构件的棱镜10和作为辅助棱镜的光透射构件50覆盖配戴者的眼睛EY的前方整体，但是并不限于此，例如如示于图24(A)及24 (B)地，也可以为以下的小型的构成:包括作为具有半透射半反射镜层15的曲面形状的第2 面S12的部分仅覆盖眼睛EY的一部分，即覆盖眼前的一部分，也存在不覆盖的部分。  Further, although the configuration of the prism 10 and the light transmission as a light guide member as a member of the auxiliary prism 50 covers the entire front of the wearer's eye EY in the embodiment described above, but is not limited thereto, as e.g. shown in FIG. 24 (a) and 24 (B), it is also may be less compact configuration: includes a portion 15 of the curved shape of the second surface S12 having the semitransparent mirror layer covers only a portion of the eye EY, i.e., front cover part, there is partially covered. 并且，该情况下，通过使棱镜10及光透射构件50充分小，即使为不透视地代替半透射半反射镜层15 而配置进行全反射的镜的构成，配戴者也能够从棱镜10及光透射构件50的周围观看外界。 And, in this case, by the prism 10 and the light transmitting member 50 is sufficiently small, even if the place of the semi-reflective mirror layer 15 is not disposed in perspective, the total reflection mirror configuration, it is possible to the wearer and from the prism 10 light transmitting member 50 around the outside of the watch. 还有，虽然在图示的情况下，在第2面S12的整体或基本整体形成半透射半反射镜层15,但是也可以仅在第2面S12的一部分形成半透射半反射镜层15。 Also, although in the illustrated case, the semitransparent mirror is formed on the second surface layer is integrally or substantially integrally S12 15, but may be formed semitransparent mirror layer 15 only on a part of the second surface S12. 并且，虽然在图24(B)的例中，在眼睛EY的基本正面配置半透射半反射镜层15,但是也可以偏离正面地配置半透射半反射镜层15,并通过移动视线而可以观看图像。 Also, although in the embodiment of FIG. 24 (B), the basic front eye EY arranged semitransparent mirror layer 15, but may be arranged semi-reflective mirror layer 15 deviate positively, and but may be viewed through the eye movement image. 例如，也可以为眼睛EY的位置稍稍向下（稍稍提高棱镜10及光透射构件50的位置）。 For example, the position may be slightly downwardly eye EY (slightly improved light transmission member 50 and the position of the prism 10). 该情况下，例如成为能够从棱镜10及光透射构件50之下看到眼睛EY的下半部分的状态。 In this case, for example, be able to see the part of the eye EY of points from a state under the prism 10 and the light transmitting member 50. 虽然在所述的说明中，关于具备一对显示装置100A、100B的虚像显示装置100进行了说明，但是也能够为单个的显示装置。  In the above description, the display device includes a pair of about 100A, 100B of the virtual image display apparatus 100 has been described, it is also possible for a single display device. 也就是说，也可以构成为：并非对应于右眼及左眼的双方，各一组地设置投影透视装置70及图像显示装置80,而是仅对于右眼或左眼的某一方设置投影透视装置70及图像显示装置80，单眼观看图像。 That is, the configuration may be: not correspond to both right and left eyes, a perspective projection setting means 70, and an image of a group to the display device 80, either right or left eye but for the perspective projection is provided only apparatus 70 and the image display device 80, monocular viewing image. 虽然在所述的说明中，关于一对显示装置100A、100B的X方向的间隔并未进行说明，但是两显示装置100A、100B的间隔并不限定于固定，可以通过机械机构等进行间隔的调整。  In the above description, the pair of display means on IOOA, 100B interval X direction is not explained, but the two display devices IOOA, interval 100B is not limited to fixing, and the like may be performed by mechanical means interval adjustment. 也就是说，两显示装置100A、100B的X方向的间隔能够相应于配戴者的眼宽等进行调整。 That is, two display devices IOOA, 100B interval X direction can correspond to the wearer's eye width adjustment and the like. 虽然在所述的说明中，半透射半反射镜层15仅为半透射性的膜(例如金属反射膜和/或电介质多层膜），但是半透射半反射镜层15能够替换为平面或曲面的全息元件。  In the above description, the semi-transmissive half mirror film layer 15 (e.g., a metal reflection film and / or a dielectric multilayer film) is only semi-transmissive, but transflective mirror layer 15 can be replaced flat or curved hologram element. 虽然在所述的说明中，虚像显示装置100作为头戴式显示器进行了具体的说明，但是虚像显示装置100也能够改变为平视显示器。  In the above description, the virtual image display device of the head mounted display 100 as a specific explanation, but the virtual image display device 100 can be changed to the head-up display. 虽然在所述的说明中，在棱镜10的第1面S11及第3面S13中，在表面上不施加镜和/ 或半透射半反射镜等而通过与空气的界面使图像光全反射地引导，但是关于本申请发明的虚像显示装置100中的全反射，也包括在第1面S11或第3面S13上的整体或一部分形成镜涂层和/或半透射半反射镜膜而进行的反射。  In the above description, the third surface S13 S11 in the first surface of the prism 10, a mirror is not applied, and / or the semi-reflective mirror or the like on the surface through the interface of the image to light and air totally guided, but the apparatus 100 is totally reflected in the virtual image display of the invention of the present application also includes forming a mirror coating and / or the semi-reflective mirror film is S11 or the whole or part of the upper surface S13 of the first surface 3 It reflected performed. 例如，也包括以下情况:在图像光的入射角度满足全反射条件的基础上，在所述第1面S11或第3面S13的整体或一部分施加镜涂层等，实质上对全部的图像光进行反射。 For example, also include the following: the incident angle of image light satisfies the total reflection condition based on the application of the mirror coating on the entire or part of the S11 or S13 in the third surface of the first surface or the like, substantially all of the image light reflection. 并且，只要能够得到足够的亮度的图像光，也可以通过多少具有透射性的镜涂敷第1面S11或第3面S13的整体或一部分。 And, as long as possible to obtain sufficient brightness of image light, or S11 may be whole or a part of the first surface of the third mirror surface S13 much by applying transmissive. 虽然在所述的说明中，棱镜10等沿着眼睛EY排列的横向方向延伸，但是也能够配置为，使棱镜10沿着纵向方向延伸。  Although the prism 10 and the like extending in the transverse direction are arranged in the eye EY of the description, but also be configured as the prism 10 extends along the longitudinal direction. 该情况下，光学构件110具有并非直列而是并列地平行配置的结构。 In this case, the optical member 110 having a parallel structure, but not in-line arranged in parallel. 2. 根据权利要求1所述的虚像显示装置，其特征在于： 所述棱镜具有光射出侧的第1棱镜部分和光入射侧的第2棱镜部分，所述光射出侧的第1棱镜部分具有第1面、第2面和第3面;并且所述第1棱镜部分和所述第2棱镜部分一体形成。 The virtual image of the display device of claim 1, wherein: said second prism having a first prism portion and a prism portion of the light incident side of the light emission side, a first prism portion of the light-emitting side has a first surface, the second surface and the third surface; and wherein the first portion and the second prism prism portion are integrally formed. 3. 根据权利要求1所述的虚像显示装置，其特征在于： 在所述第2面形成半透射半反射镜，将图像光提供给观看者，并在所述第2面的外侧一体地配置光透射构件，使相对于外界光的视度基本为O，将外界光和图像光重叠地提供给观看者。 The virtual image of the display device of claim 1, wherein: the semi-reflective mirror is formed in the second surface, the image light provided to the viewer, and integrally arranged on the outside of the second surface light transmitting member, the phase of the external light to the visual basic is O, the ambient light superimposed image light provided to the viewer. 4. 根据权利要求3所述的虚像显示装置，其特征在于： 所述光透射构件在观看者侧具有第1透射面和第2透射面并在外界侧具有第3透射面， 所述棱镜的第2面和所述光透射构件的第2透射面具有基本相同的曲面形状，所述第2面和所述第2透射面一体化。 4. The virtual image display device of claim 3, wherein: said light transmissive member having a first transmitting surface and the second transmitting surface on the viewer side and has a third transmissive surface on the external side, the prism the second transmitting surface and the second surface of the light transmitting member having substantially the same curved shape, and the second face of the second transmissive surface integration. 5. 根据权利要求2所述的虚像显示装置，其特征在于： 进一步具备使来自所述图像元件的图像光入射于所述棱镜的投影透镜； 至少所述棱镜的一部分和所述投影透镜构成形成中间像的中继光学系统。 The virtual image of the display device according to claim 2, characterized in that: further comprising image from the image element of the prism light incident on a projection lens; at least a portion of the prism and the projection lens configuration is formed a relay optical system of the intermediate image. 6. 根据权利要求5所述的虚像显示装置，其特征在于： 所述投影透镜包括轴对称的透镜，包括至少1个面以上的非球面。 The virtual image according to claim 5, wherein the display means, wherein: said projection lens comprising an axisymmetric lens, comprising at least one or more aspherical surfaces. 7. 根据权利要求5所述的虚像显示装置，其特征在于： 所述第2棱镜部分至少具有1个以上的光学面，并通过所述图像元件、所述投影透镜和所述第2棱镜部分形成中间像。 The virtual image according to claim 5, wherein the display means, characterized in that: the second prism portion having at least one optical surface, and the image member through the projection lens and the second prism portion forming an intermediate image. 8. 根据权利要求7所述的虚像显示装置，其特征在于： 所述图像元件为从显示位置射出图像光的图像显示元件； 所述投影透镜和所述第2棱镜部分作为所述中继光学系统，使从所述图像显示元件的显示位置射出的图像光在所述棱镜的内部成像而形成中间像。 8. The virtual image display device of claim 7, wherein: said image display element as an image element the image light emitted from the display position; said projection lens and said second optical prism as part of the relay system, the display position of the image display element of the image light emitted from the inside of the prism forming an intermediate image is formed. 9. 根据权利要求7或8所述的虚像显示装置，其特征在于： 所述第2棱镜部分具有兼具作为折射面及反射面的功能的至少1个以上的光学面。 The virtual image according to claim 7 or 8 display device, wherein: said second prism portion having both at least one optical surface as a function of the refractive surface and reflective surface. 10. 根据权利要求1所述的虚像显示装置，其特征在于： 所述第1面与所述第3面的间隔为5mm以上且15mm以下。 10. The virtual image display as claimed in claim 1 of the apparatus, characterized in that: said first surface and said third surface spacing is 5mm or more and 15mm or less. 11. 根据权利要求1所述的虚像显示装置，其特征在于： 所述第2面相对于所述第1面的倾斜角为20°以上且40°以下。 11. The virtual image display device of claim 1, wherein: said second surface to said first surface inclination angle of 20 ° or more and 40 ° or less. 12. 根据权利要求1所述的虚像显示装置，其特征在于： 包括所述棱镜的所述光学系统在配戴时覆盖观看者的眼前之中的一部分，使眼前未被覆盖的部分存在。 12. The virtual image display as claimed in claim 1 of the apparatus, characterized in that: said optical system comprises a covered portion of the prism in front of the viewer when wearing the uncovered front part presence. 13. 根据权利要求1所述的虚像显示装置，其特征在于： 所述图像元件具有射出对应于图像调制的信号光的信号光形成部和通过使从所述信号光形成部入射的信号光扫描而作为扫描光射出的扫描光学系统。 Claim 13. The virtual image display device of claim 1, wherein: said image signal having a light scanning element corresponding to the image signal emitted from the signal light modulated light forming portion and the light incident portion is formed by a signal from the as the scanning light emitted from the scanning optical system.